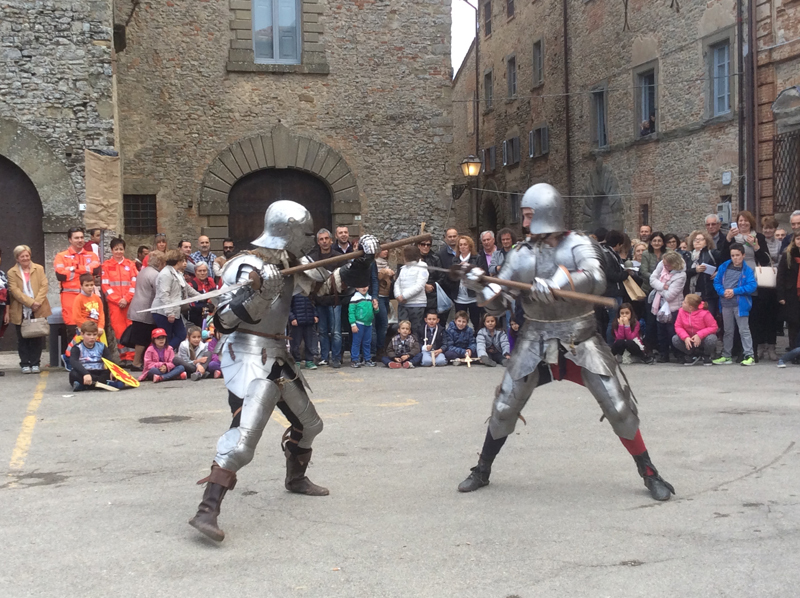 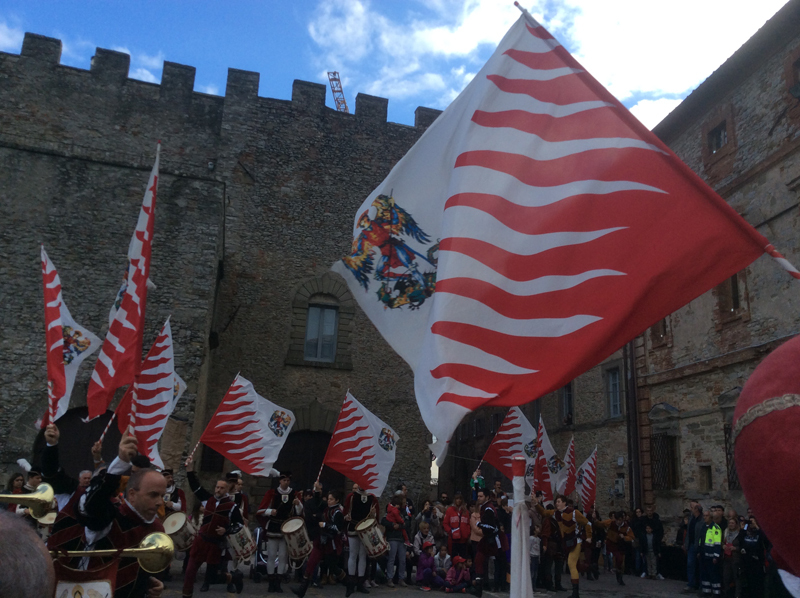 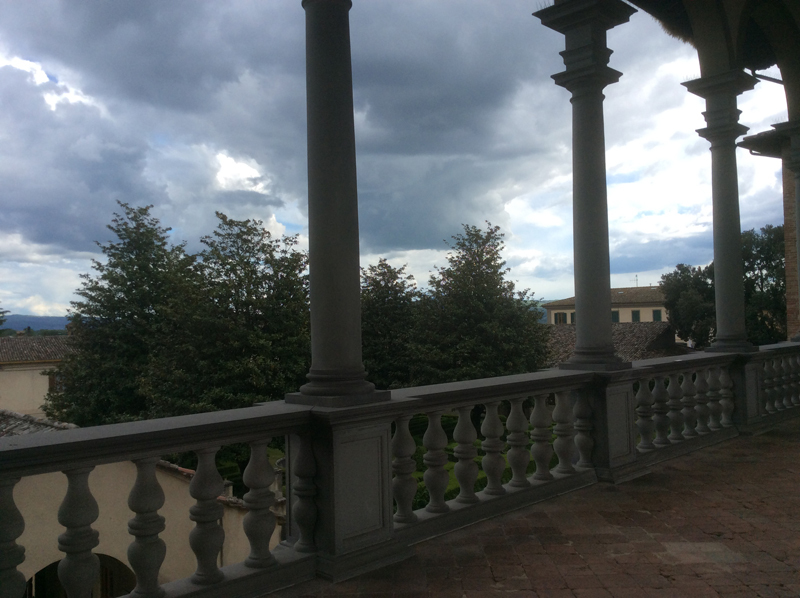 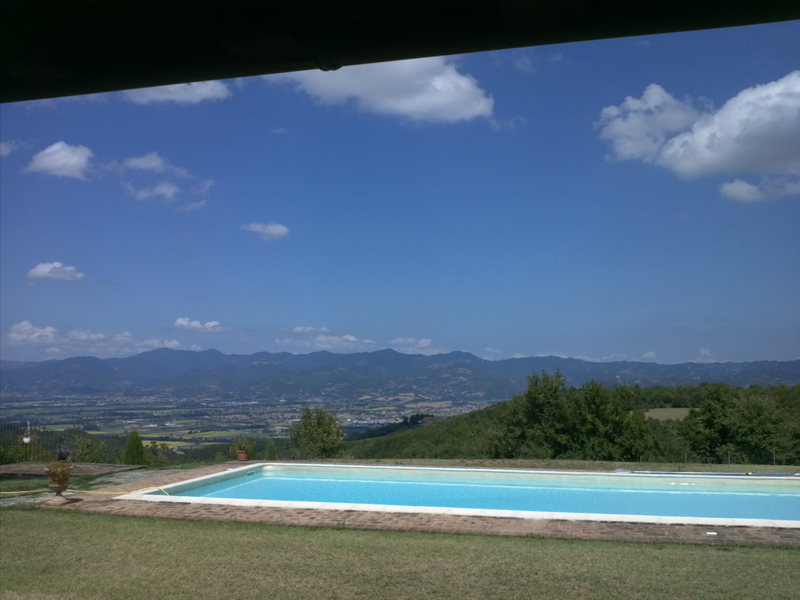 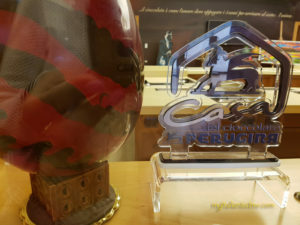 Cortona & Acquasparta: Let's Go Sagras! 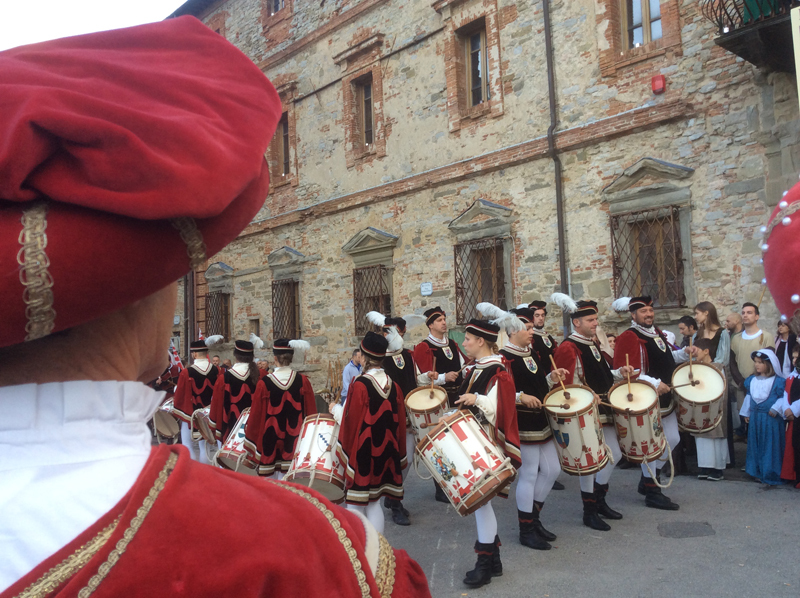 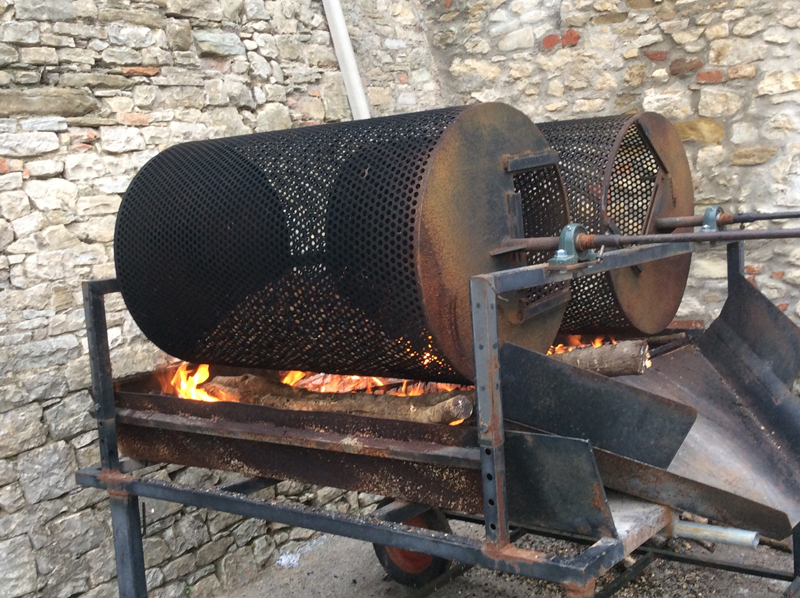 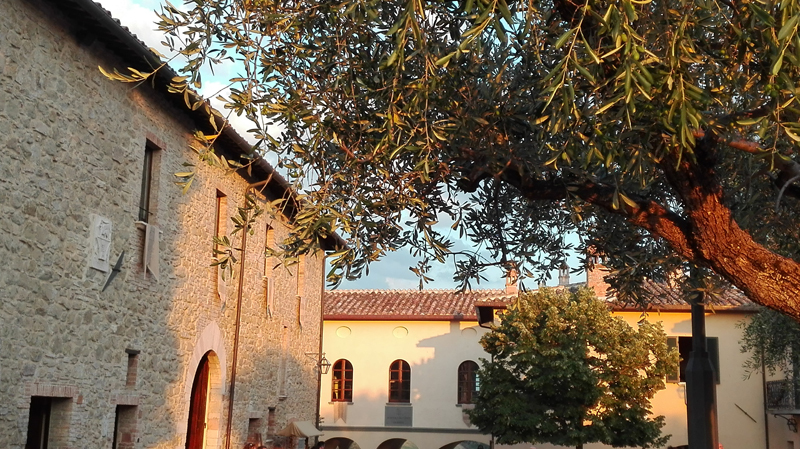 This year’s Cantine Aperte weekend has been filled with time with friends in the countryside around Montefalco. 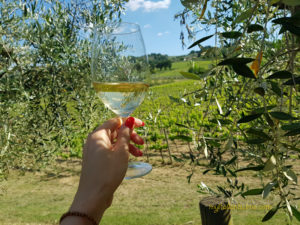 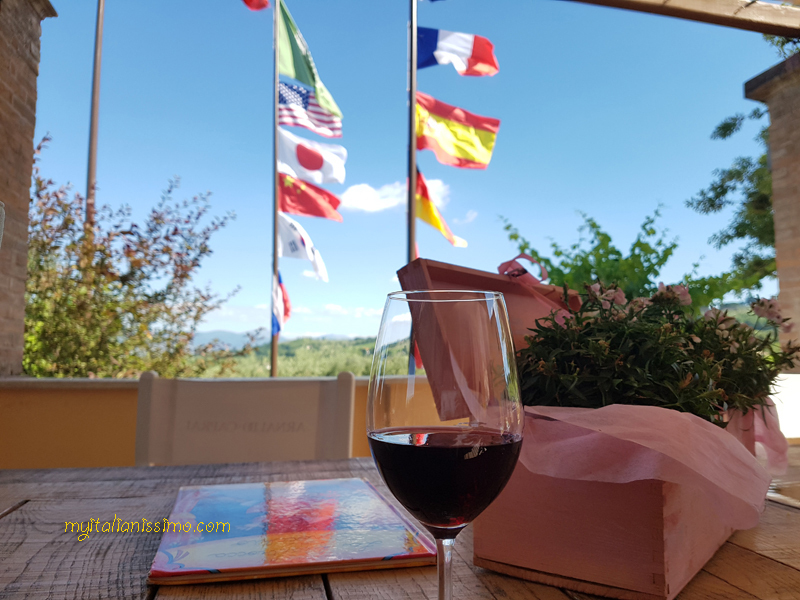 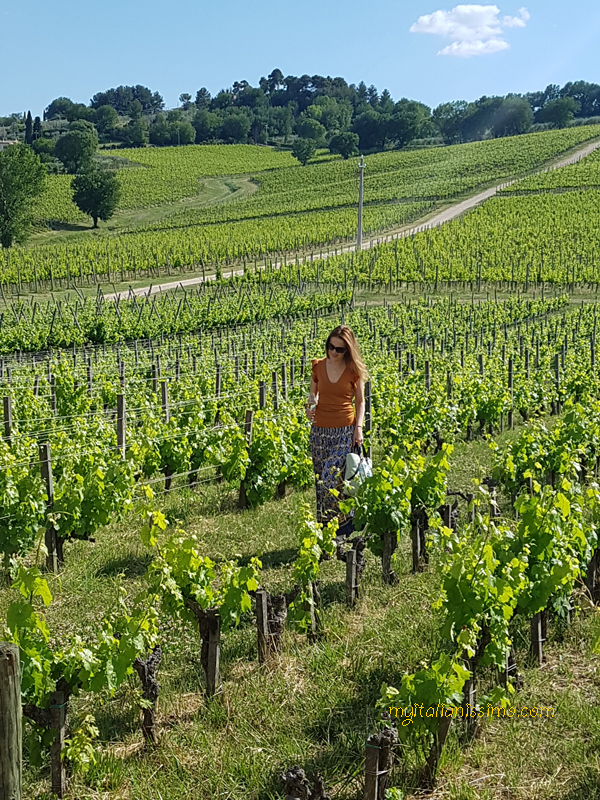 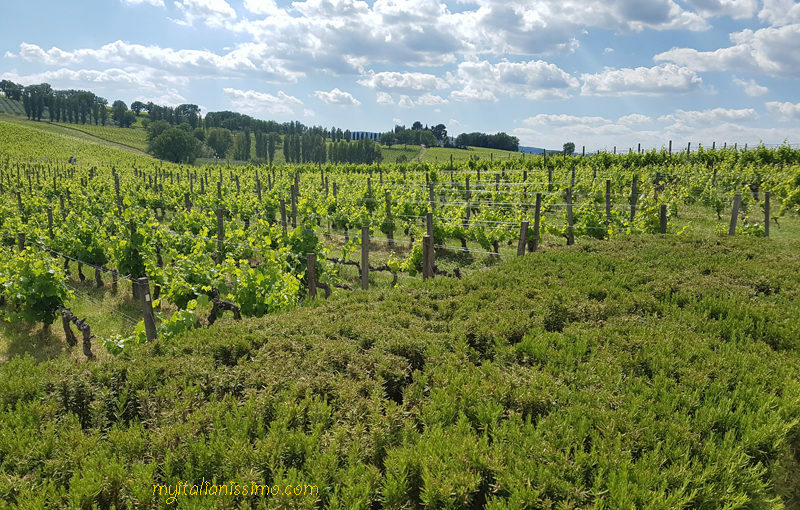 It was about tasting gorgeous wines, strolling through the vines, and enjoying stunning views over some of Umbria’s finest landscapes. 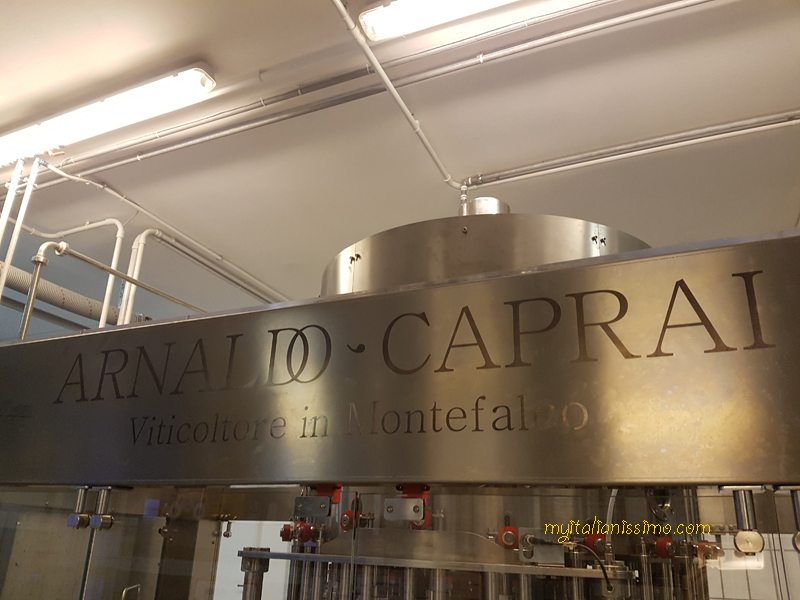 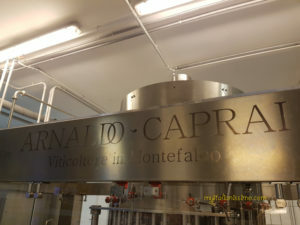 And what better place to learn about the local superstar grape Sagrantino than at the Arnaldo Caprai vineyard. 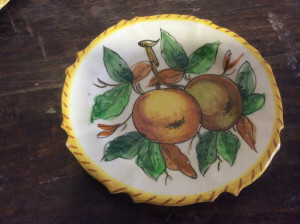 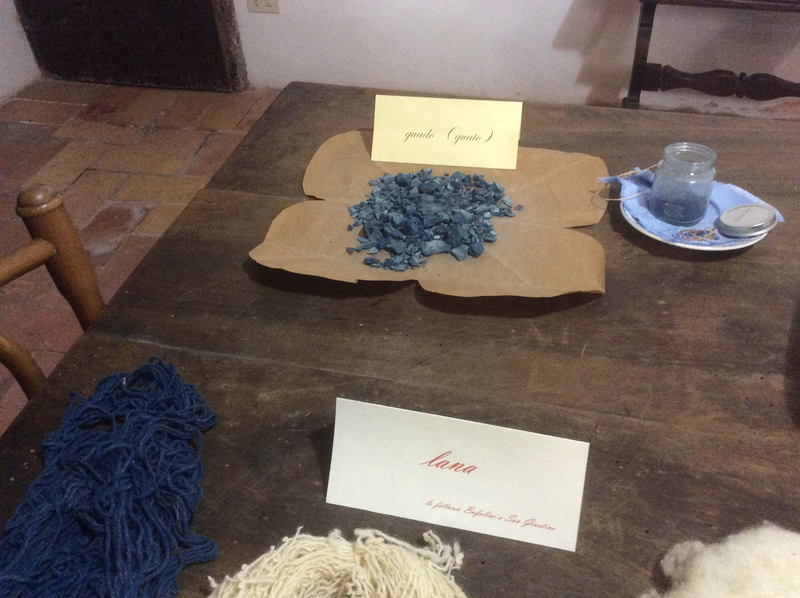 Umbrian families have been perfecting their crafts for generations. 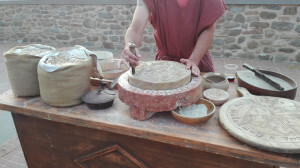 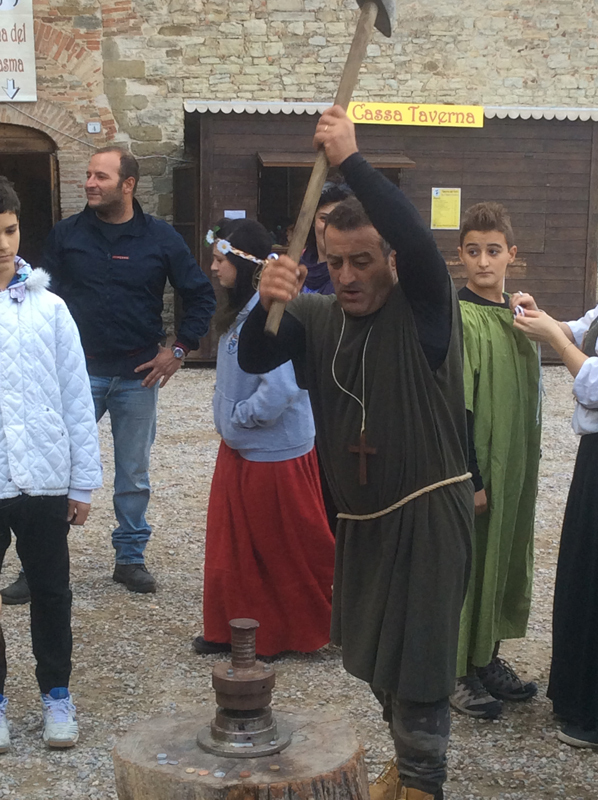 And that goes for harvesting olives, sculpting ceramics and, of course, winemaking. 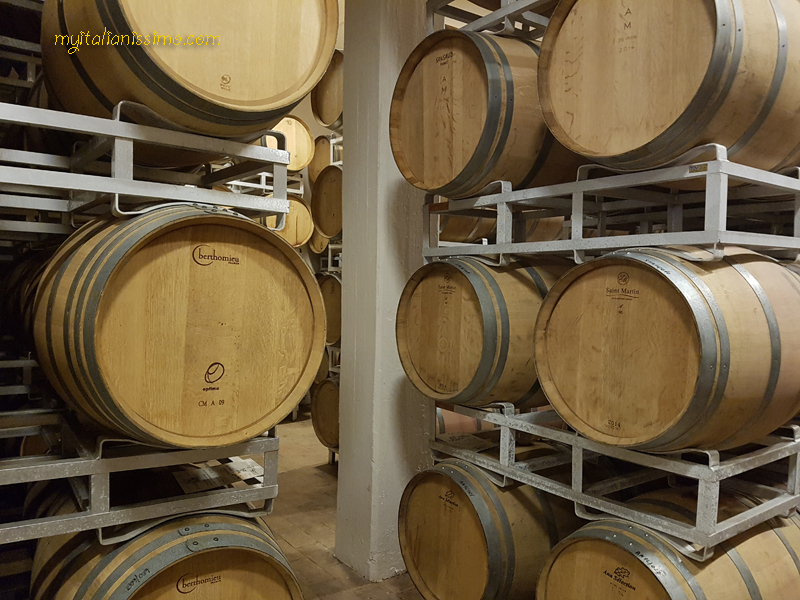 Visiting this beautiful winery was on the top of my ‘to do’ list for years. 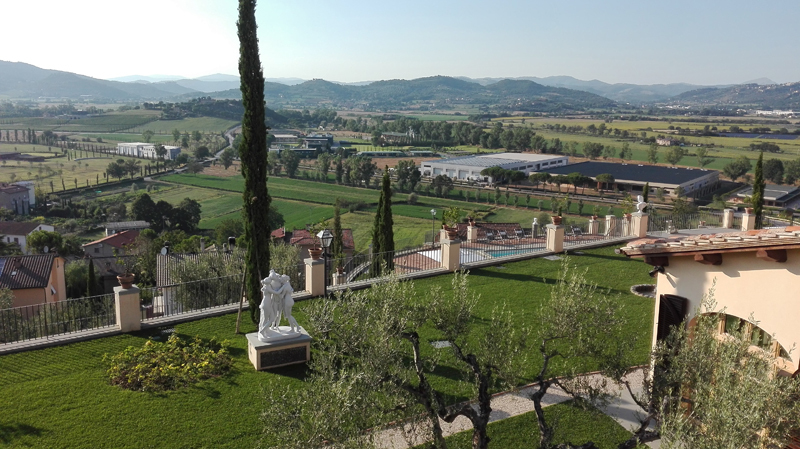 They are evangelical about taking visitors on tours, tastings, or even gourmet picnics among the vines – the setting makes for the perfect al fresco dining experience. 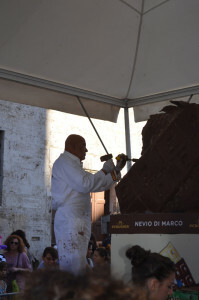 The man himself, Mr Marco Caprai. 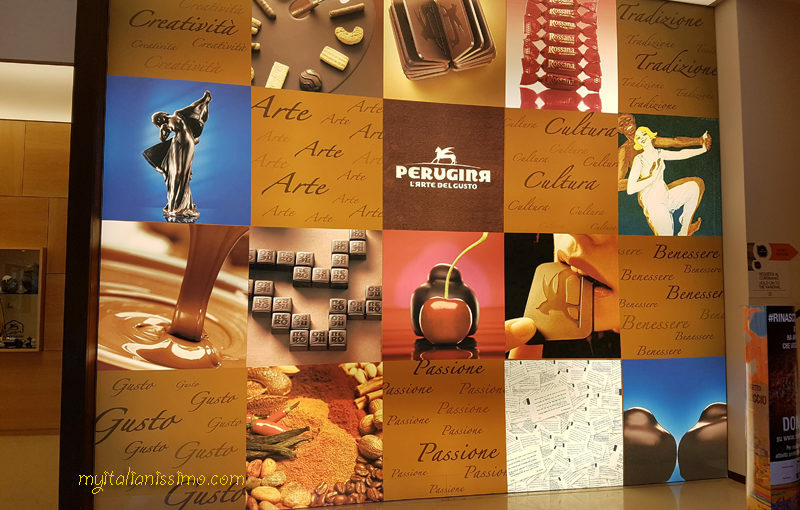 Since 1988 Marco Caprai has been leading the company in his pursuit of giving the tradition an innovative approach. 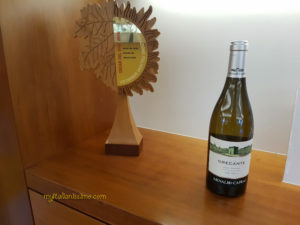 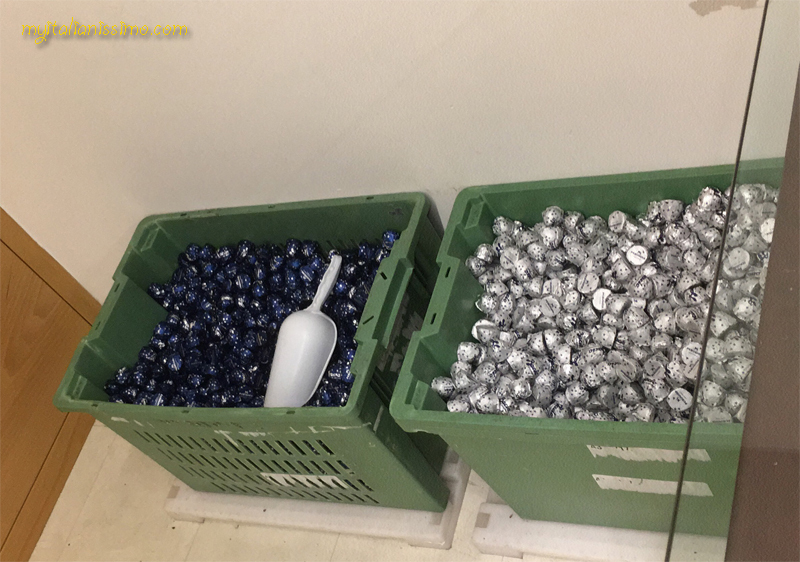 Harnessing his personal talent and skills, he made a commitment to produce high quality wines through environmentally conscious innovation, sustainable winery and farming operations. 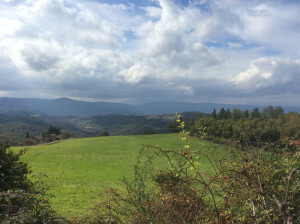 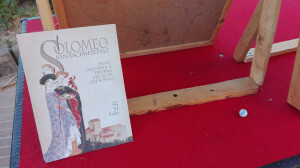 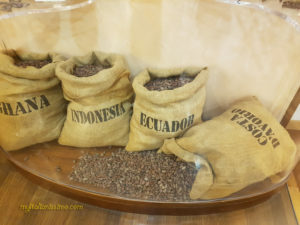 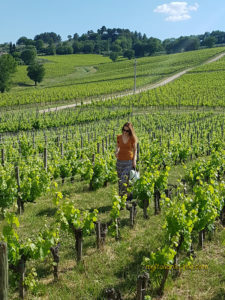 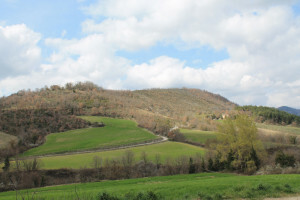 This, and the desire to preserve the landscape and regional identity, has lead to years of research in the agronomic and enological fields, which also involved the University of Agriculture of Milan. 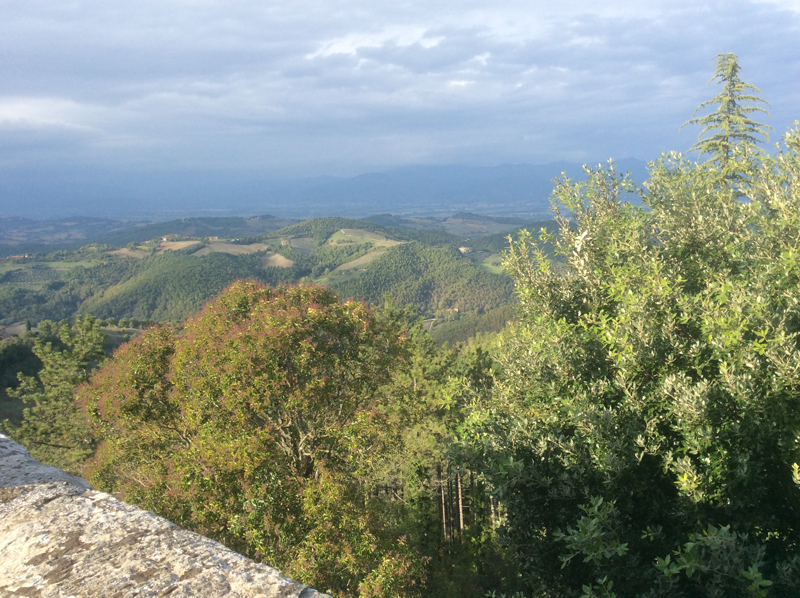 The wine is just as amazing as the views. In the glass: Colli Martani Grechetto DOC Grecante. 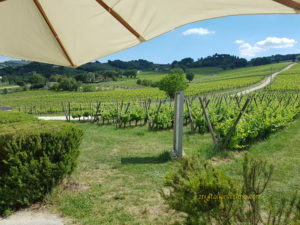 Savour a glass of delicious Arnaldo Caprai wines while taking in the stunning panorama! 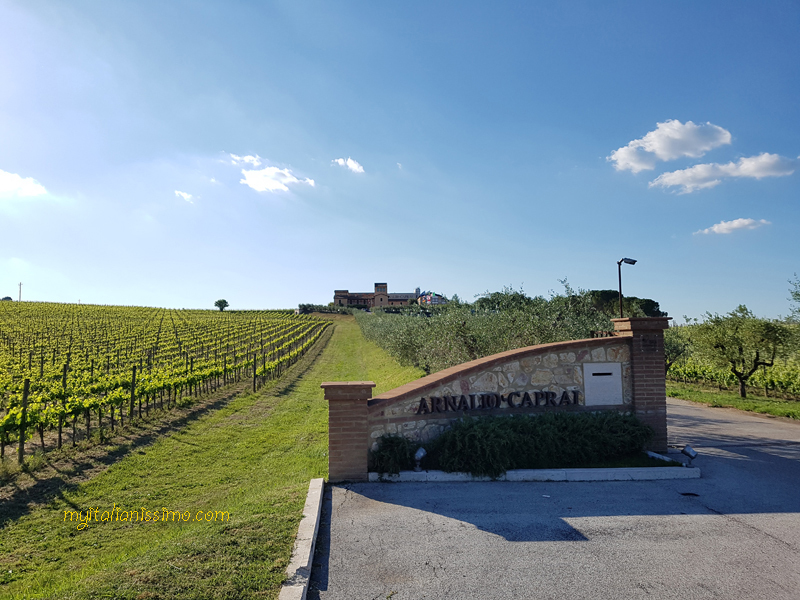 Arnaldo Caprai Grechetto Colli Martani Grecante 2015: #1 on Wine Spectator’s list of Italian white wines for summer. 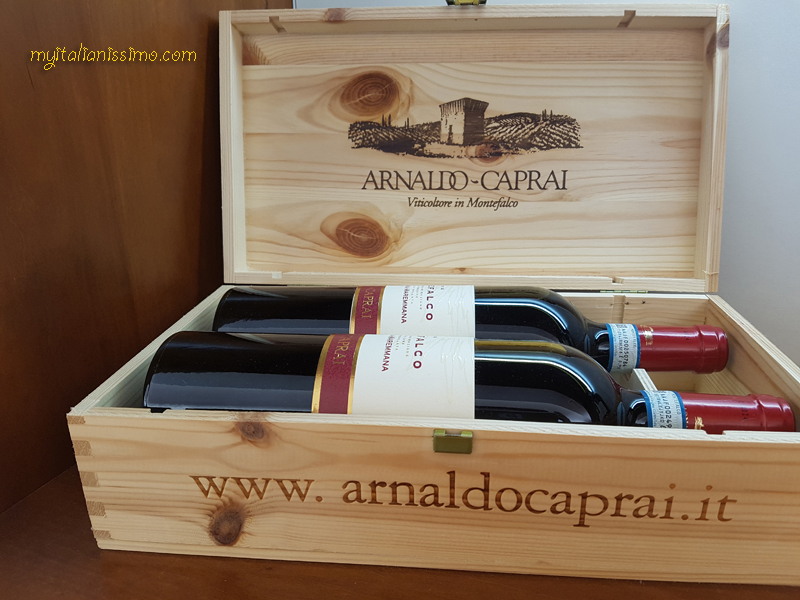 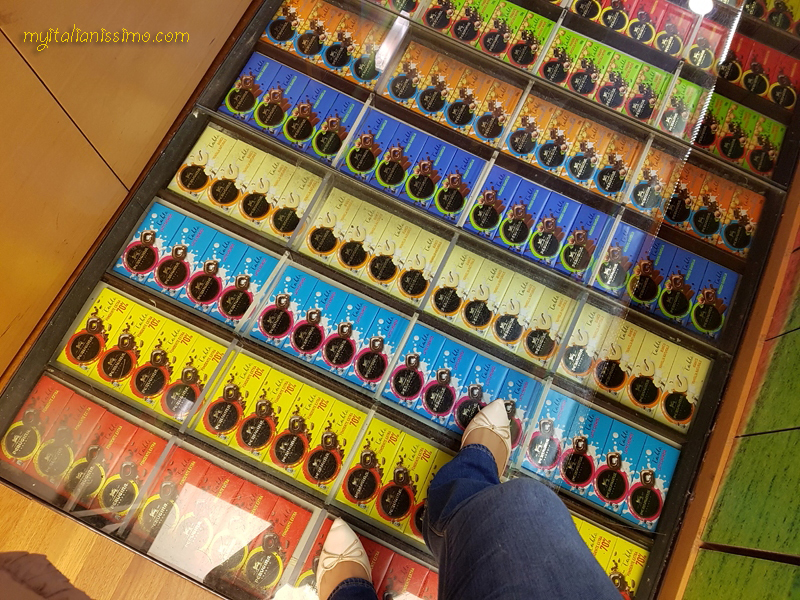 The exclusive cases filled with a hand-picked selection of superb wines. Two charming hilltop hamlets just outside of Perugia await discovery. The characteristic hamlet of Solomeo is nestled in the beautiful green hills of Umbria. 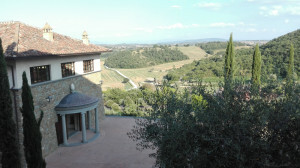 It’s a peaceful place, surrounded by silence, hospitality and breathtaking scenery. The village has recently been rediscovered. 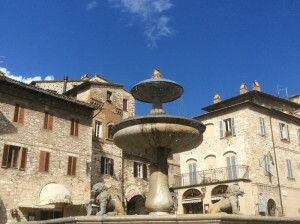 It regained its ancient splendor and returned to its former glory thanks to its resident – cashmere entrepreneur Brunello Cucinelli – who restored it completely, with love and respect. 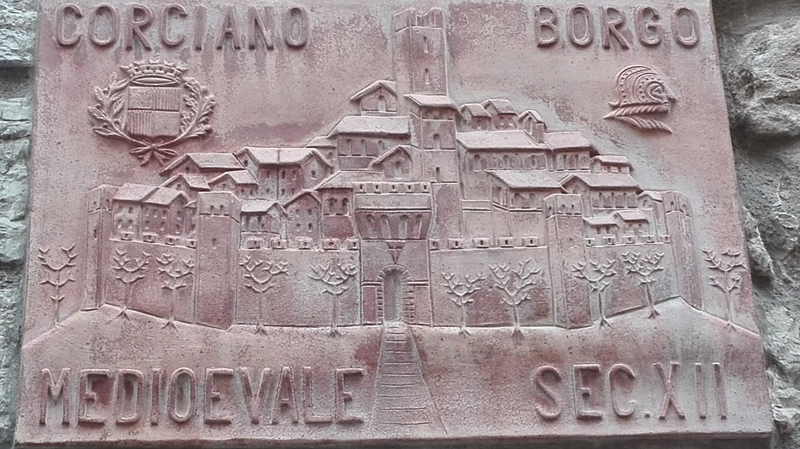 The 13th– century hamlet of Solomeo was built on the site of an ancient settlement known as Villa Solomei. 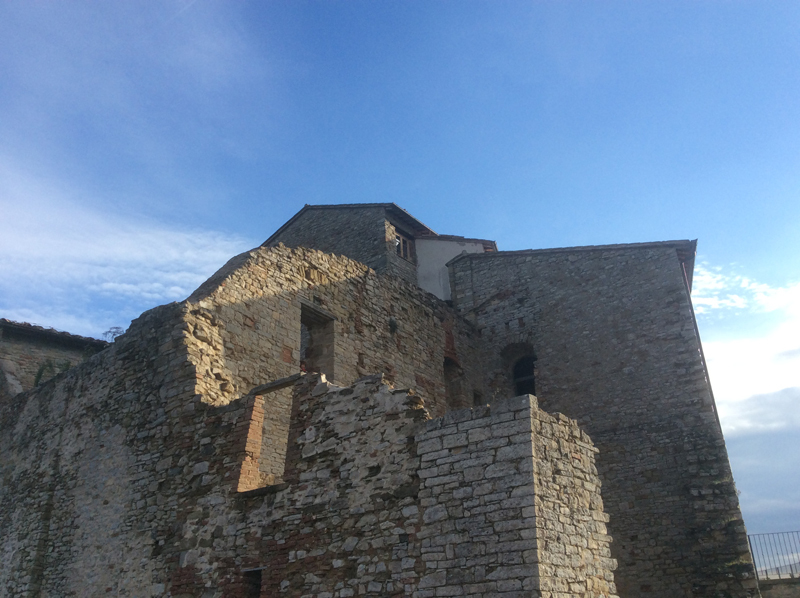 In 1391 its inhabitants decided to fortify the village and build a castle. 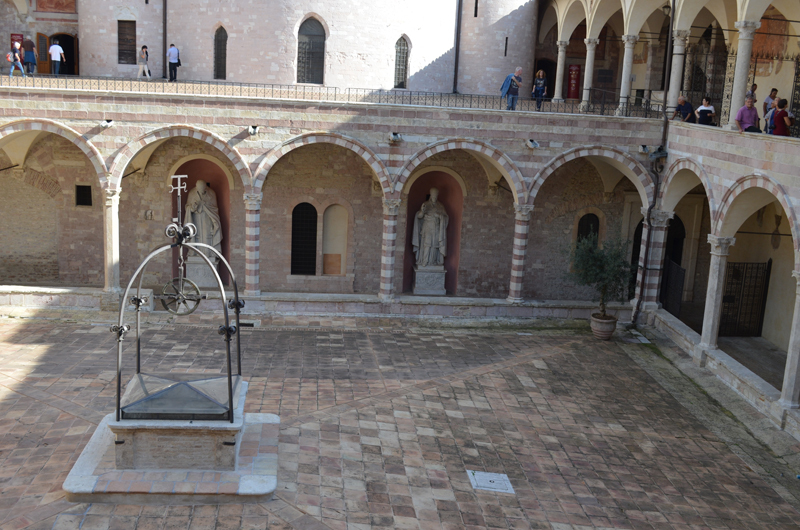 The beautiful church of St Bartholomew is a real gem, especially on the inside. 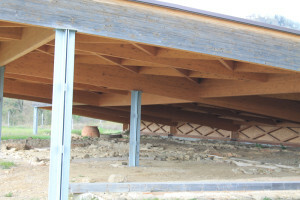 The first nucleus of this structure dates back to the 13th century. It was later rebuilt in the 18th century. 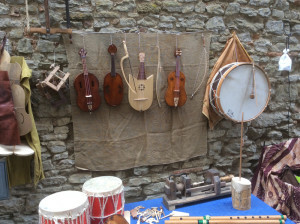 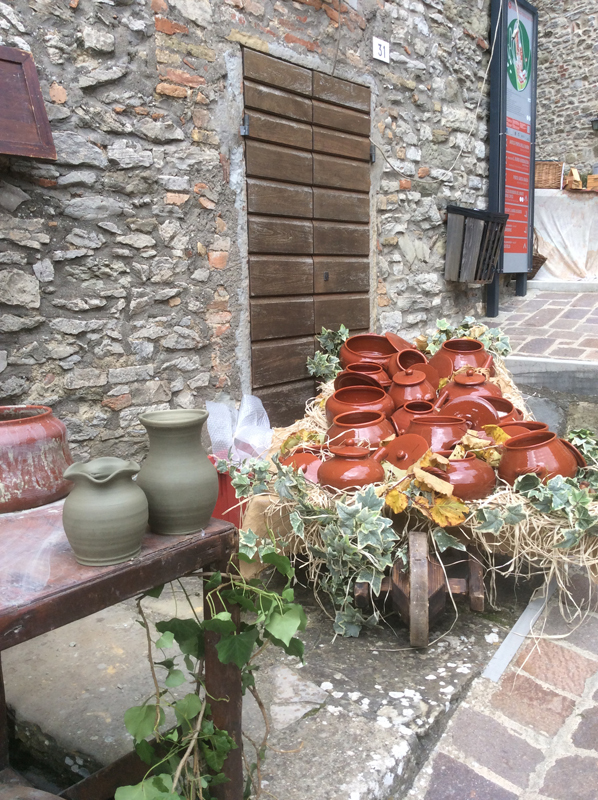 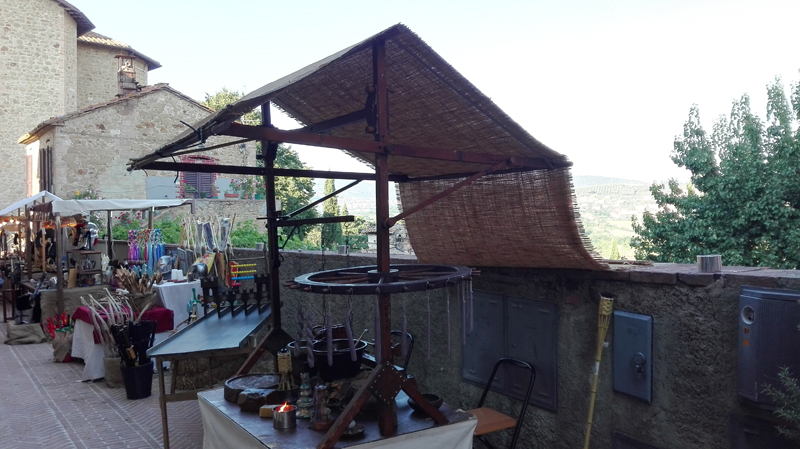 Arts and craft exhibitions are hosted in the village streets, lit with hundreds of torches, along with regional specialties tastings in this perfect atmosphere: handmade pasta, high quality local produce, homemade desserts, wine, torcoli with vin santo, and of course, my favourite panzanella (bread salad)..
Falconers, minstrels, artisans, jugglers welcome visitors, connoisseurs of Italian village life and of Brunello’s cashmere! 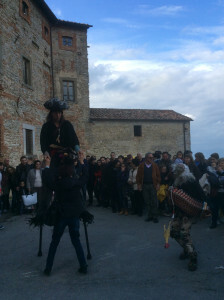 Falconry show in the open-air amphitheater. 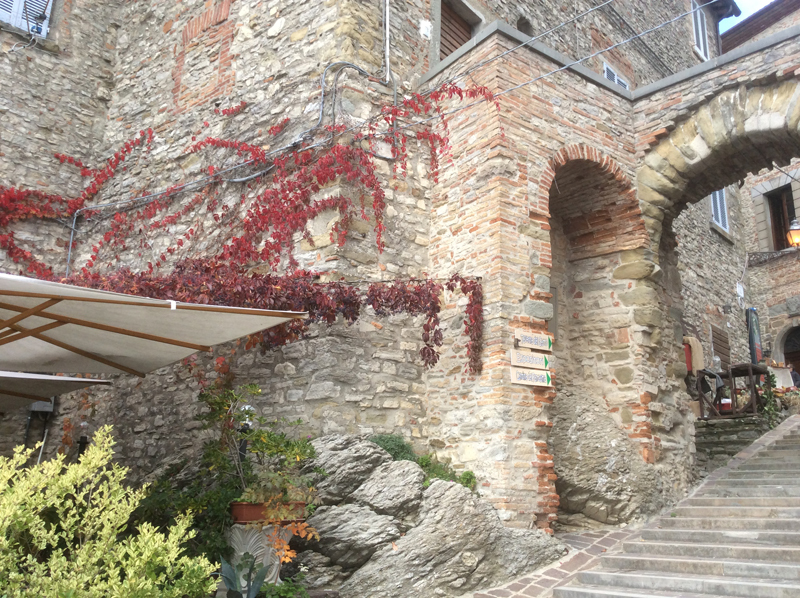 You can feel Brunello’s patronage in every detail. A curved Ionic portico and colonnade leading to the entrance to the Cucinelli Theatre. 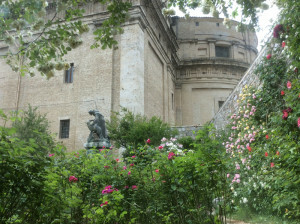 It faces the large amphitheater where concerts are held. 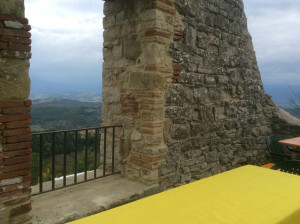 Internationally renowned artists perform on these stages. Do not miss the Villa Solomei Festival – a unique occasion to enjoy classical music of the highest level. 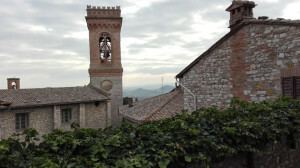 The centuries-old town of Corciano is just 9km away. 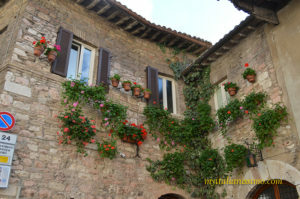 It is listed among the Most Beautiful Italian Villages and is a charming evocative place to wander. 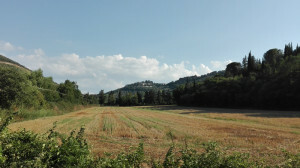 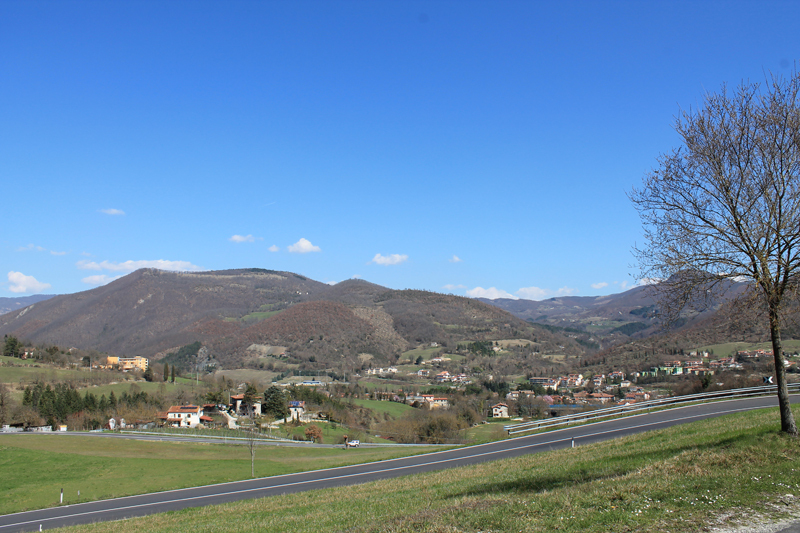 Corciano is surrounded by three concentric walls and vast green swaths of land. 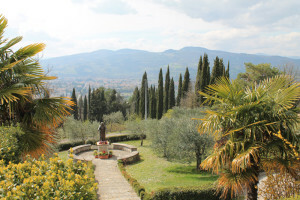 Park at the entrance to the hamlet and walk up through the Porta Santa Maria. As you walk up and down the narrow streets and steps, taking pictures and enjoying beautiful panoramas from the numerous viewpoints, you are taken by timeless medieval atmosphere. 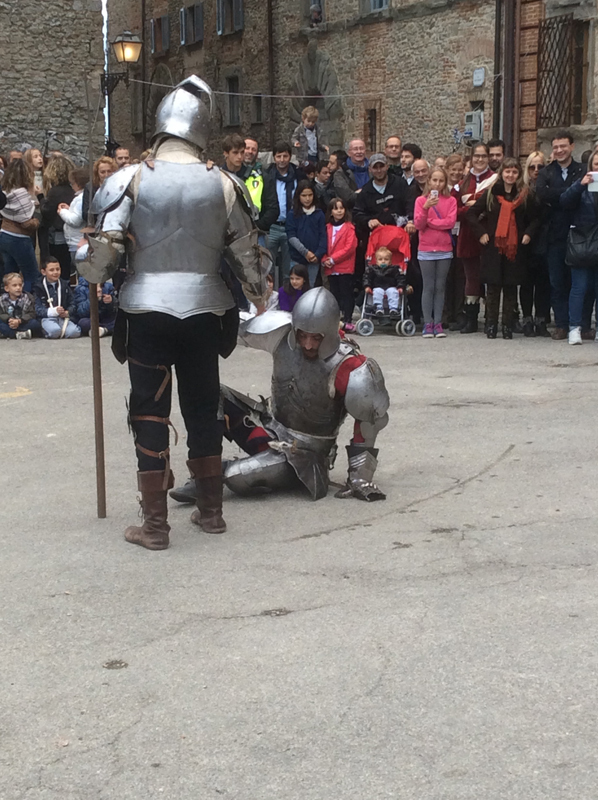 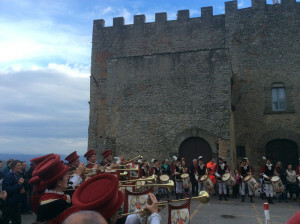 Corciano was a strategic site, overlooking the valley that joined the Trasimeno area and the Tiber River valley, quite a desirable stronghold in the constant warfare of the 14th and 15th centuries. 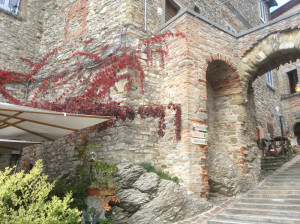 Legend has it that the castle of Corciano was founded by Coragino, the mythical companion of Ulysses. The iconic tower Torrione di Porta Santa Maria built in 1482. 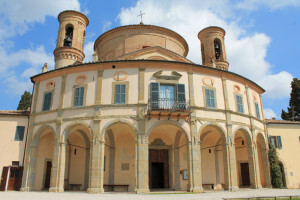 Church of Santa Maria Assunta (13th century), where one can admire the Assumption by Perugino (1513) and the Gonfalon by Benedetto Bonfigli (1472). So if you are exploring the area, looking for a simple, peaceful getaway, consider a visit to these evocative and atmospheric villages. 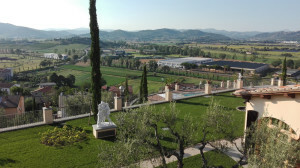 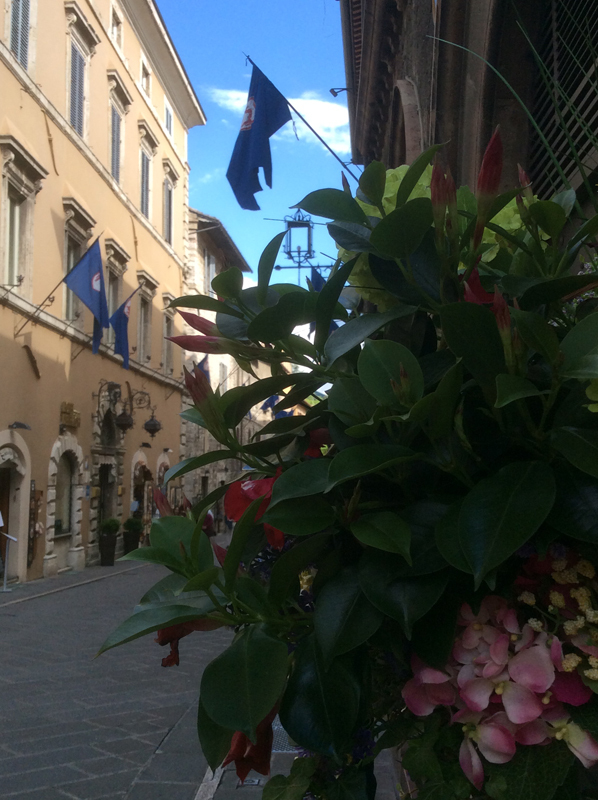 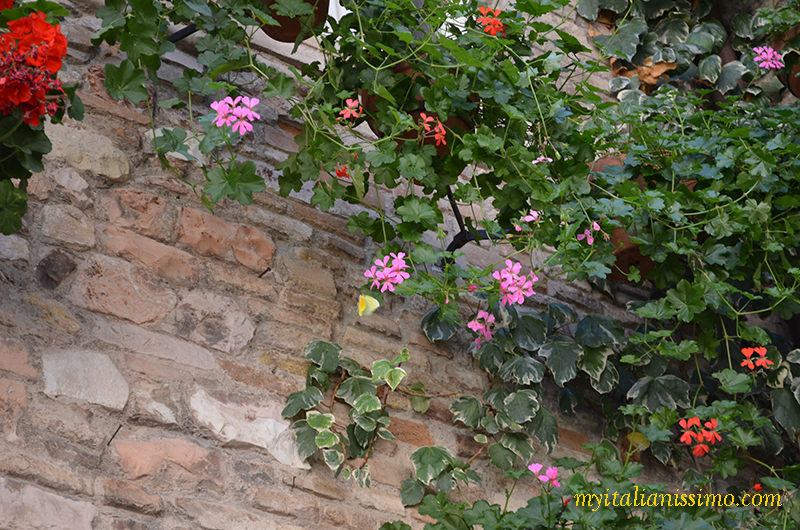 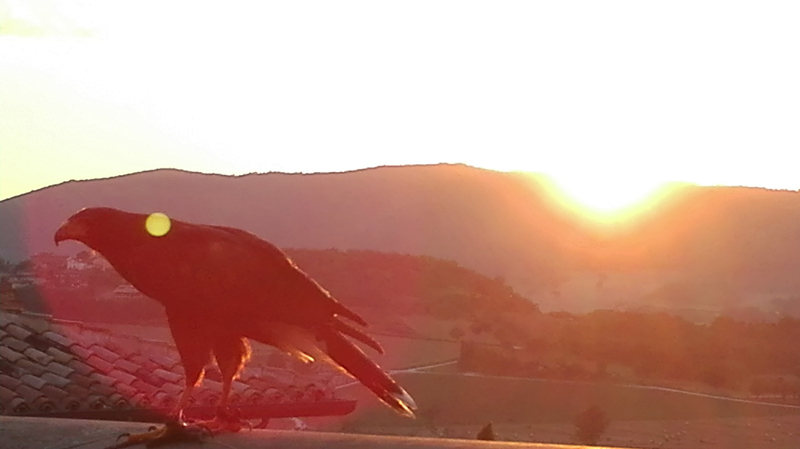 As this is what Umbria really is – authentic, unspoiled and traditional . 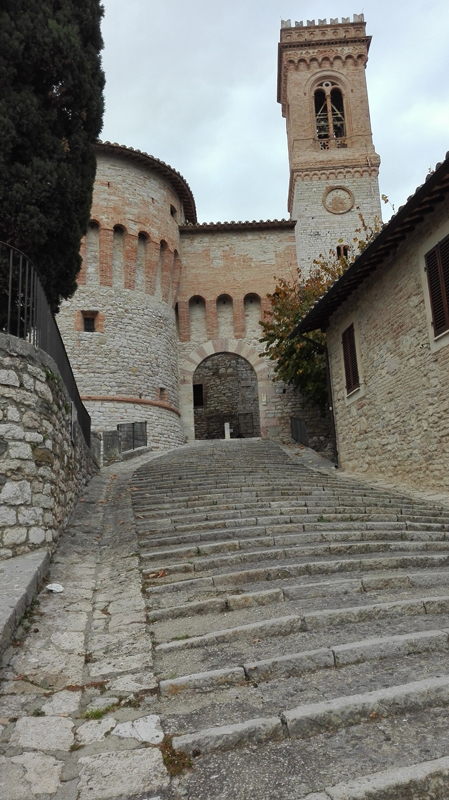 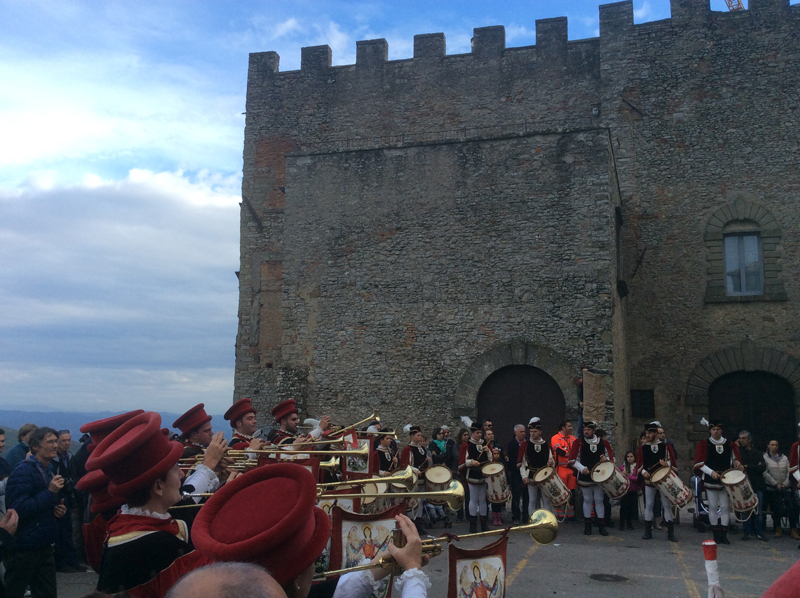 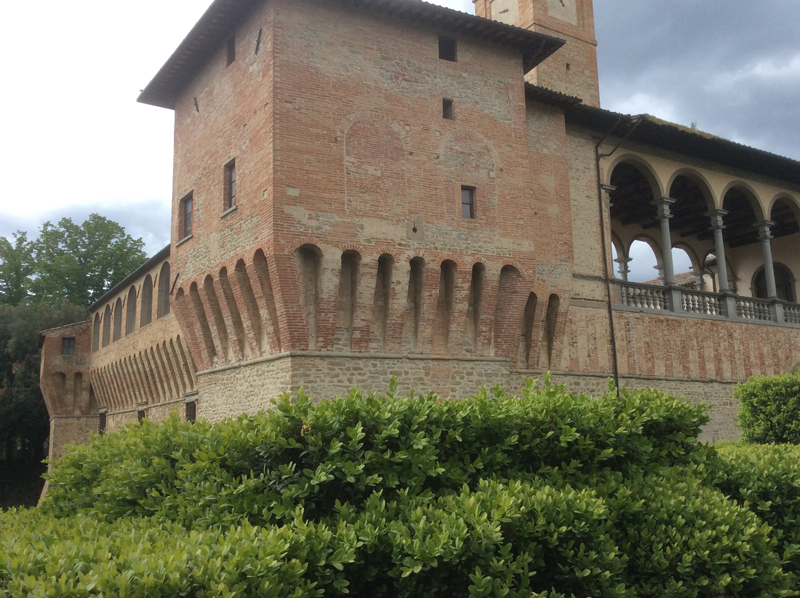 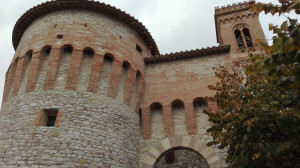 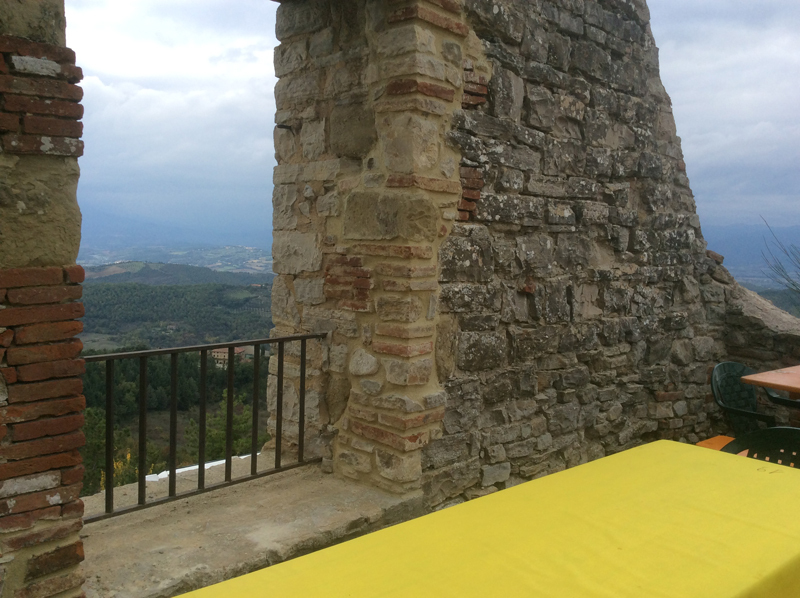 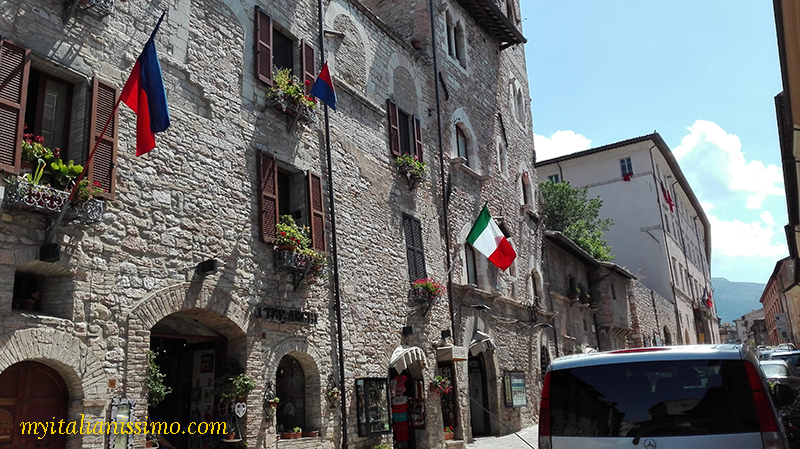 The Bufalini Castle in the town centre of San Giustino is a must-see. 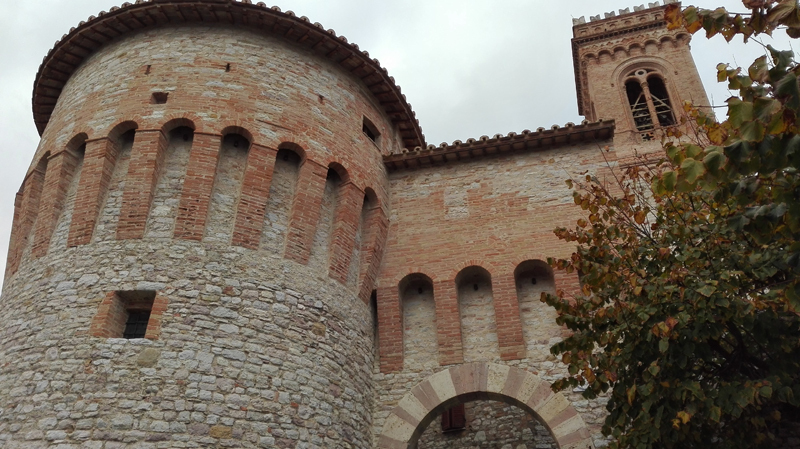 Once a medieval fort of San Giustino, aimed to defend the territory of the larger town of Città di Castello, the castle we see today is a rare example of a noble residence. 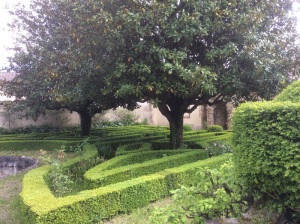 It has recently reopened its gates to welcome visitors into its beautiful Italian garden with mazes of the late 17th century. 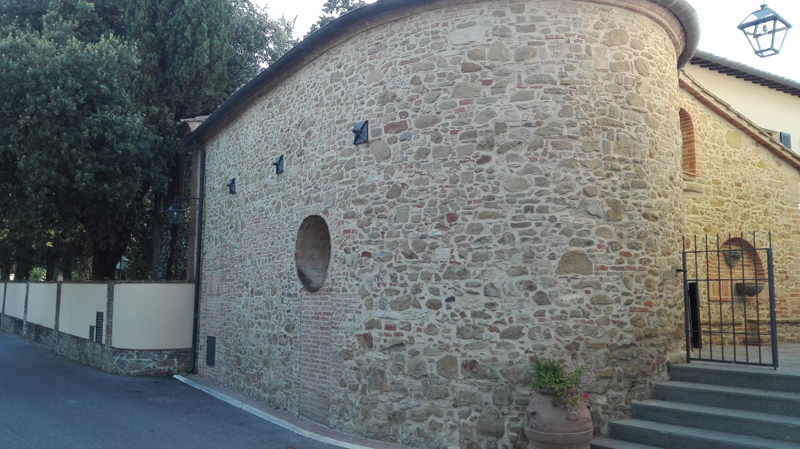 The Renaissance complex, which Giovanni Magherini Graziani used to call ‘a villa within a fortress‘, is surrounded by fortified walls. 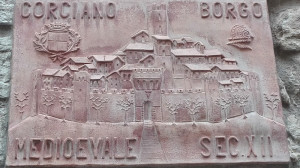 In 1487 the castle became property of the Bufalini family, and Niccolò di Manno Bufalini from the nearby Città di Castello financed the reconstruction of the military fortress, succeeded by his great-grandchildren who, between 1530 and 1560, decorated it with artworks including frescoes by Cristofano Gherardi (Sansepolcro 1508 – 1556). 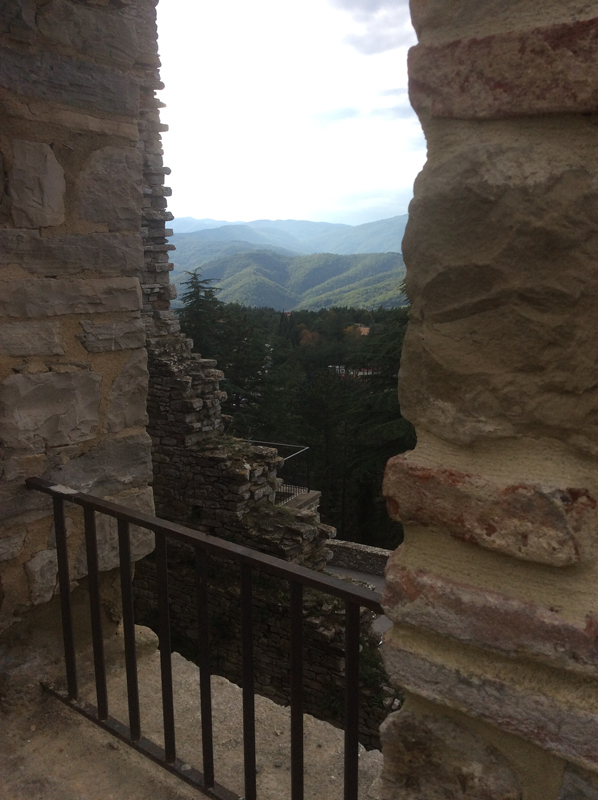 I loved the sense of discovery as I stepped inside the castle. 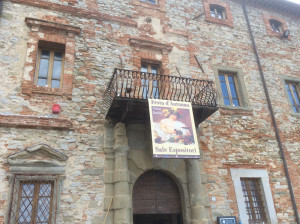 The collection we can admire here today conveys the atmosphere once lived by an ancient Umbrian family, through artworks, fine furniture, ceramics and crystals. A family, whose members distinguished themselves in military, ecclesiastical, literary and juridical spheres while serving the Papal States, the House of Medici, the House of Este, and some Spanish, French and English royal families. 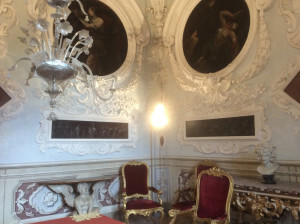 The Stucco Room, or Gallery of Strong Women: a set of red velvet carved wood chairs made in the Marche region, and beautiful stucco framing a series of paintings on canvas showing tales of strong women. 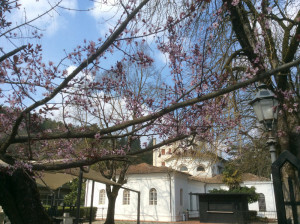 Open on Sundays and holidays, tickets €5. 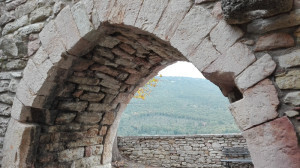 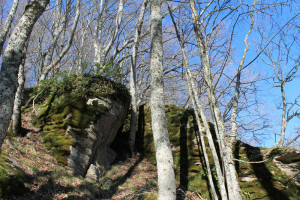 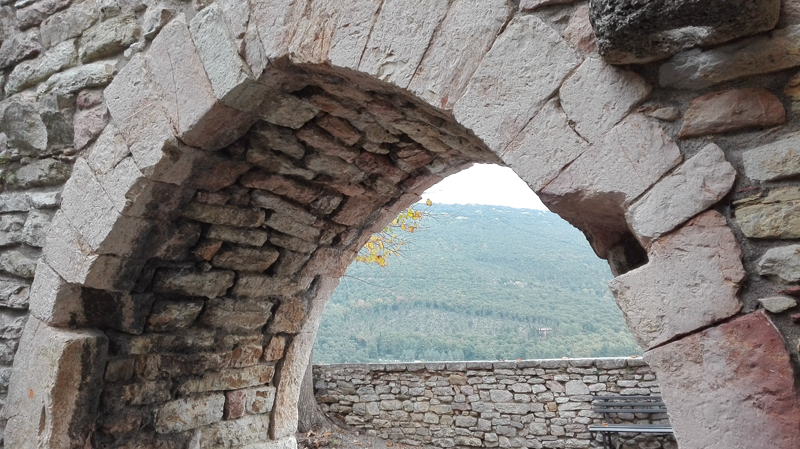 Read about more sites to visit in the area in The Upper Tiber Valley: More History Along the Hillsides. 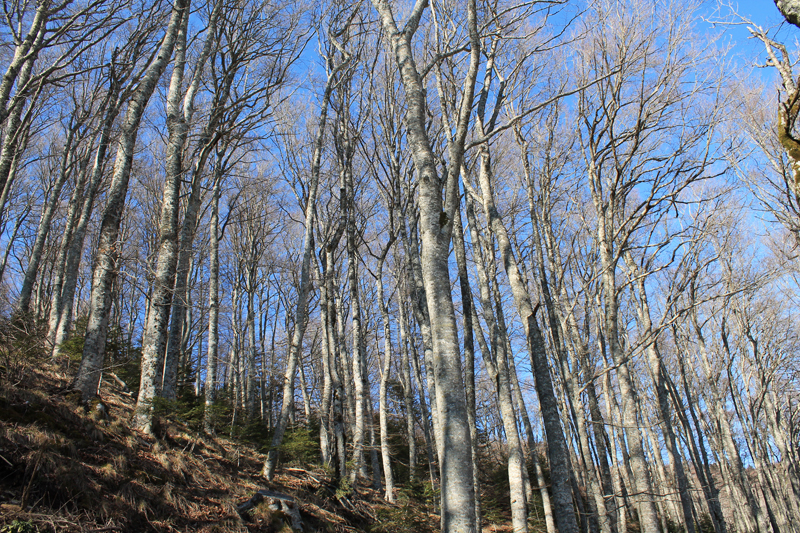 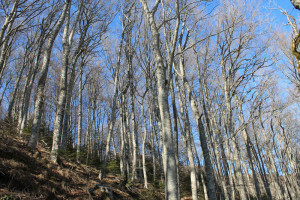 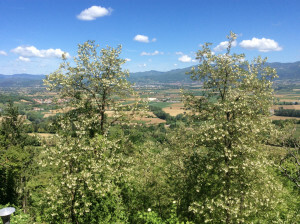 The Upper-Tiber Valley has a great number of various paths, like those rich in Franciscan lore, linking Assisi and La Verna, the two spiritual poles, where piety, along with art expressions, flourished in all the places that Saint Francis passed through. 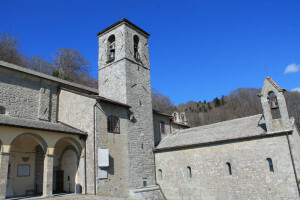 The Sanctuary of La Verna (in Tuscany), where The Franciscan Trail begins. 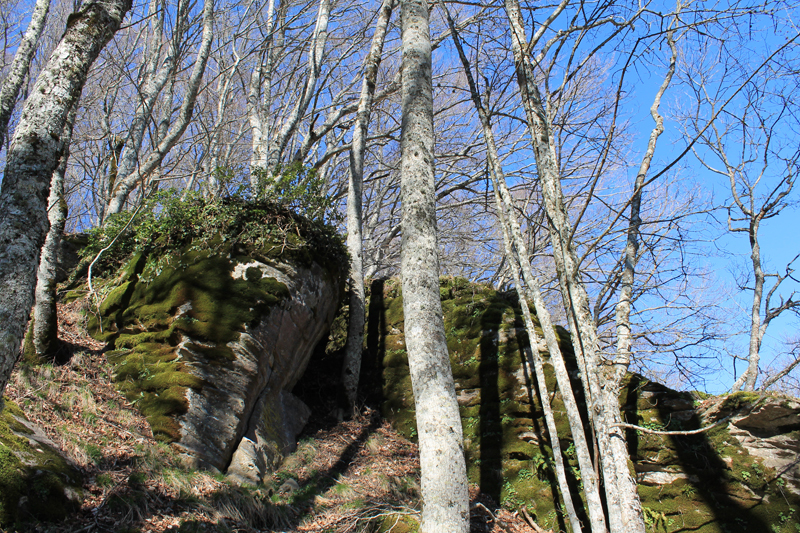 It crosses the region in 16 steps, through flourishing woodlands, farmed valleys, paths and places that inspired the saint. If you like hiking, you’ll discover the untouched natural beauty of the valley with its fascinating history, towns, isolated abbeys, places where miracles took place, the ancient artworks inspired by peace message and love for all living creatures. 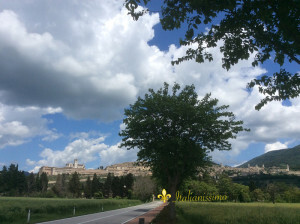 As you walk, you can admire hillsides dotted with old stone farmhouses, beautiful churches, mountain streams and the amazing panoramas – a wonderful excuse to stop often, catch your breath, and snap some amazing photos. 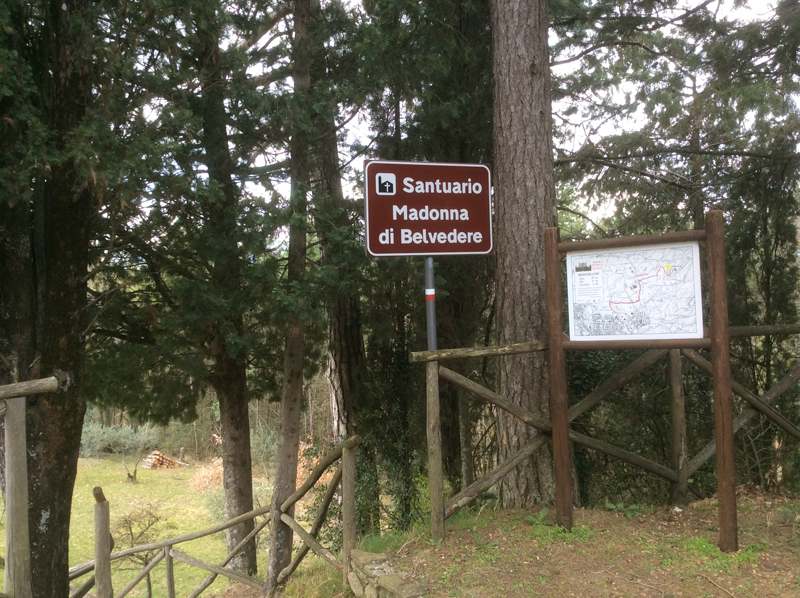 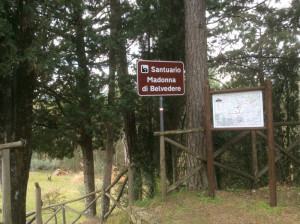 The Baroque Sanctuary of Madonna di Belvedere, a short distance from Città di Castello (5 km following the SS Apecchiese). Built between 1669 and 1684 with a dome between the two majestic bell towers, it offers beautiful vistas of the town, the valley and the mountains of La Verna and Monte Acuto near Umbertide. The imposing complex dominates the valley, like the Sanctuary of Canoscio, which I mentioned in another post. 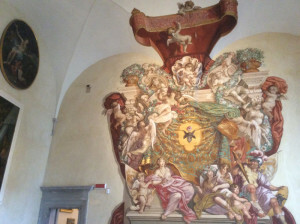 From a distance, it appears to me like the one from Raphael’s Marriage of the Virgin, which he painted in 1504 for the Church of St. Francis in Città di Castello. 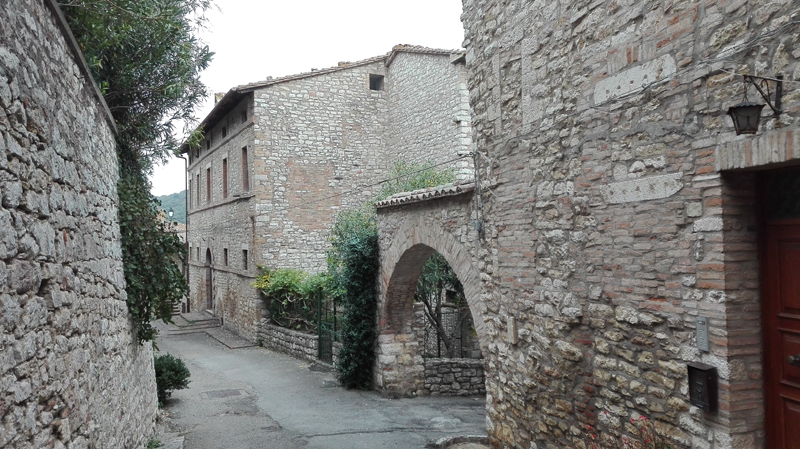 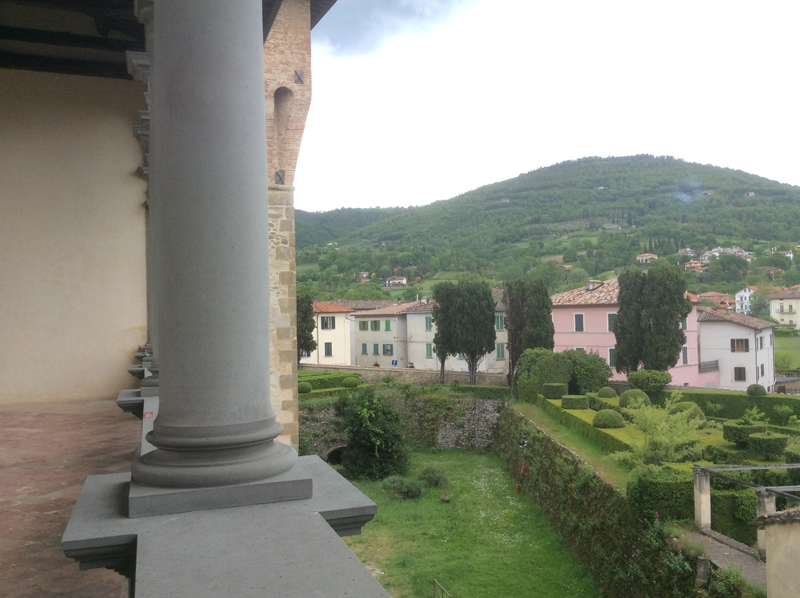 Colle Plinio – Pliny’s home in the Upper Tiber Valley. The remains of the ancient ‘Villa in Tuscis’ of Pliny the Younger, brought to light in the 1970s, along with its thermal plant – a Calidarium (hot bath), a Tepidarium (warm bath) and a Frigidarium (a large cold pool), as well as a temple of Ceres, harvest cellars, earthenware, etc. 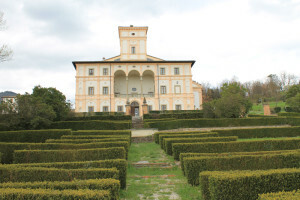 Villa Magherini Graziani, a splendid example of the early 17th century architecture. This noble estate was completed in 1616 on commission by Carlo Graziani. 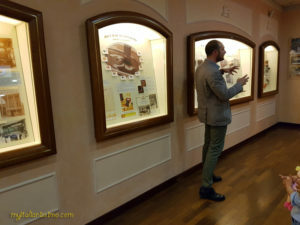 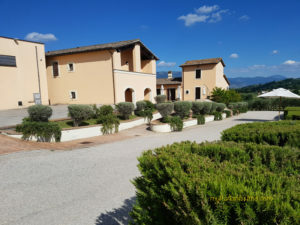 The villa houses a museum with numerous finds of the archaeological excavations carried out in 1974, ancient Roman mosaics, tiles and other objects of daily use are on display. 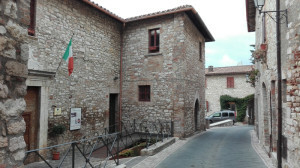 Open on Sundays and holidays, tickets €3. 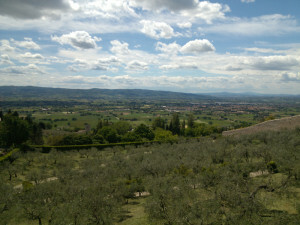 For centuries the valley was subjected to the political and military interests of the main powers of Tuscany and Umbria. 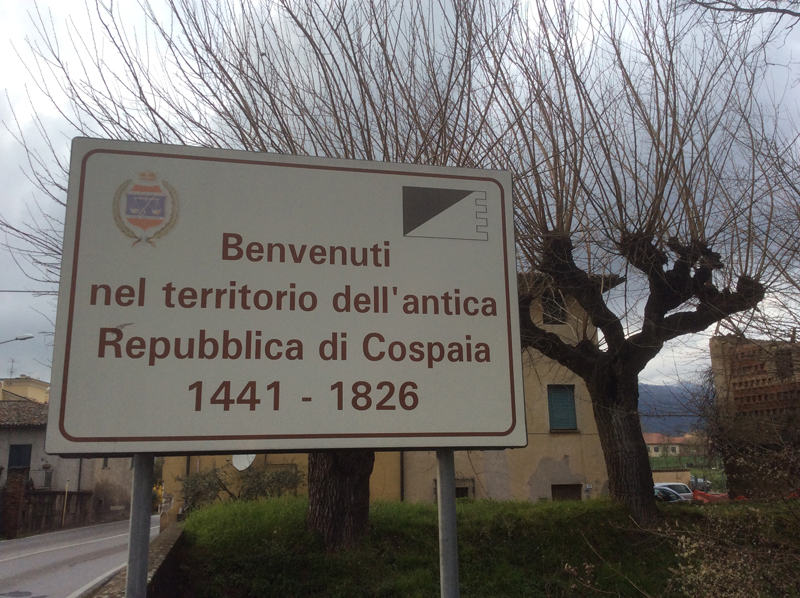 In 1441 when The Florentine Republic and The Papal States decided to define the borders, the little hill of Cospaia nestled between the two streams flowing into the Tiber, both named Rio and maximum 500 metres away from each other, wasn’t taken into account. 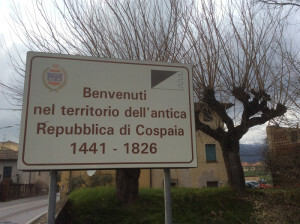 This mistake granted the tiny republic (twenty times smaller than San Marino) independence, with no written laws, heads of the state, soldiers or taxes. 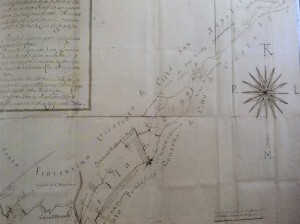 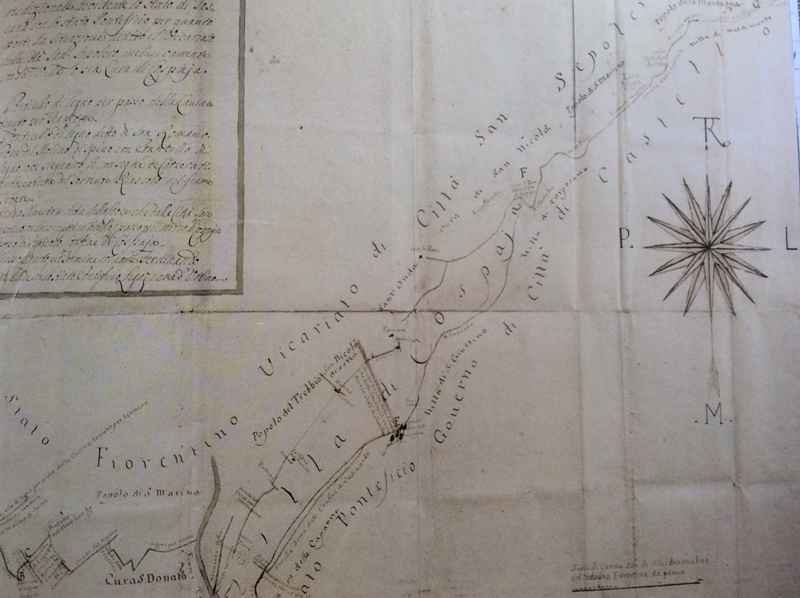 Cospaia was so small that neither of the bordering powers would fight a war to conquer it. The Republic ran great deals with both the Grand Duchy of Tuscany and the Church. 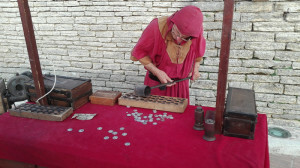 Its inhabitants lived independent lives for almost four centuries. 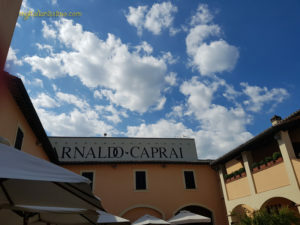 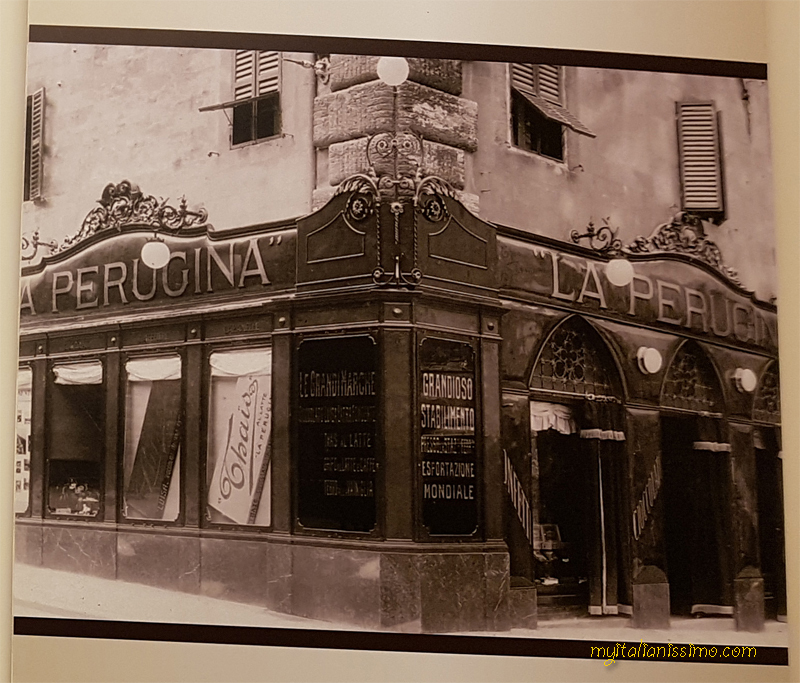 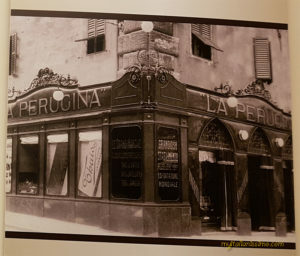 An early centre for tobacco production (started in 1574), this small strip of land became the capital of Italian tobacco. Today, Cospaia is a hamlet of the comune of San Giustino. 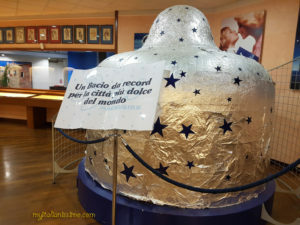 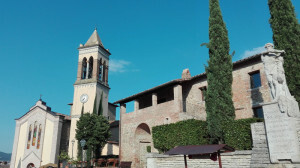 Terme di Fontecchio, Città di Castello, 3 km away from the city centre. 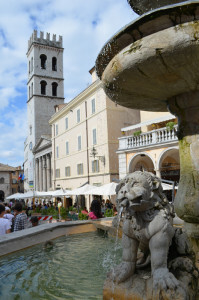 These thermal baths were already known in Roman times, when Pliny the Younger accompanied his wife Calpurnia to “maintain her beauty and grace”. Equipped with diagnostic and therapeutic centers, the Spa offers various treatments and genuine relaxation thanks to the properties of its sulphurous waters and mud. 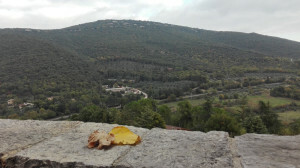 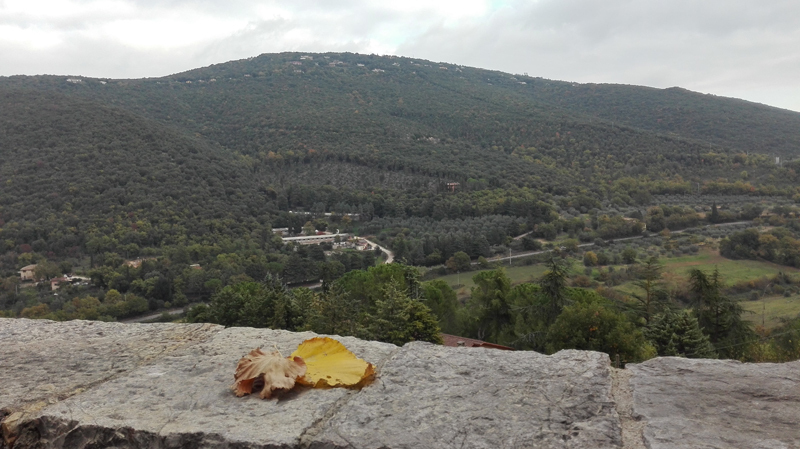 Just a short drive out of Città di Castello, Monte Santa Maria Tiberina welcomes you with beautiful vistas and great food, where chestnut and oak forests spread out over the hillsides, and where truffles, porcini mushrooms, excellent olive oil and local wine dominate the menus! La Festa d’Autunno is the biggest festival of the fall season here, celebrating the chestnut harvest in the most delicious way! Framing the festival, as usual, is the picturesque piazza, with live music and performances. 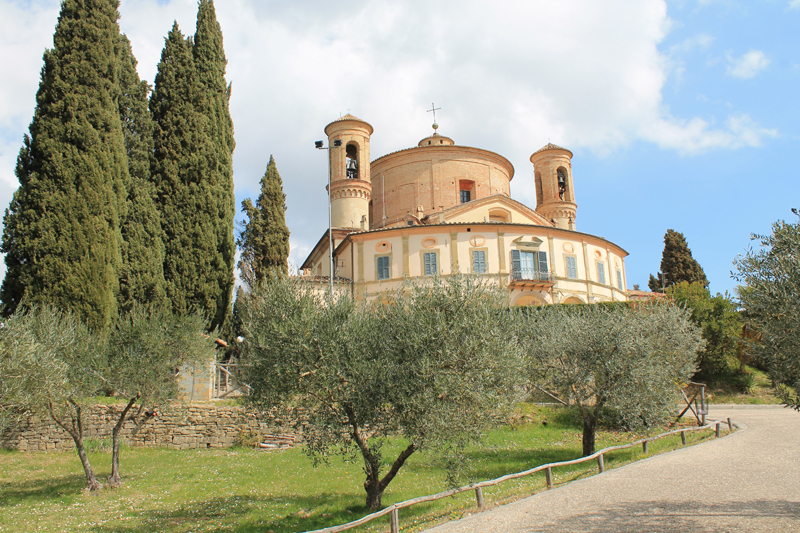 Monte Santa Maria Tiberina is really full of charm! 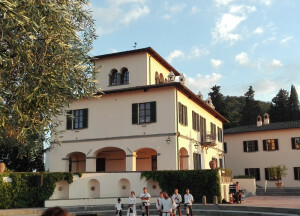 The former Prime minister of Belgium, Guy Verhofstadt, has his summer retreat here. 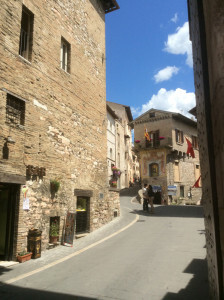 The town sits right at the border where Umbria meets Tuscany. 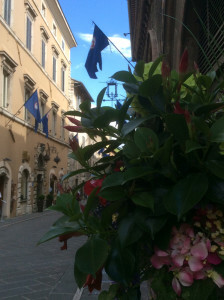 It’s quite small, but there are several restaurants and cafes. 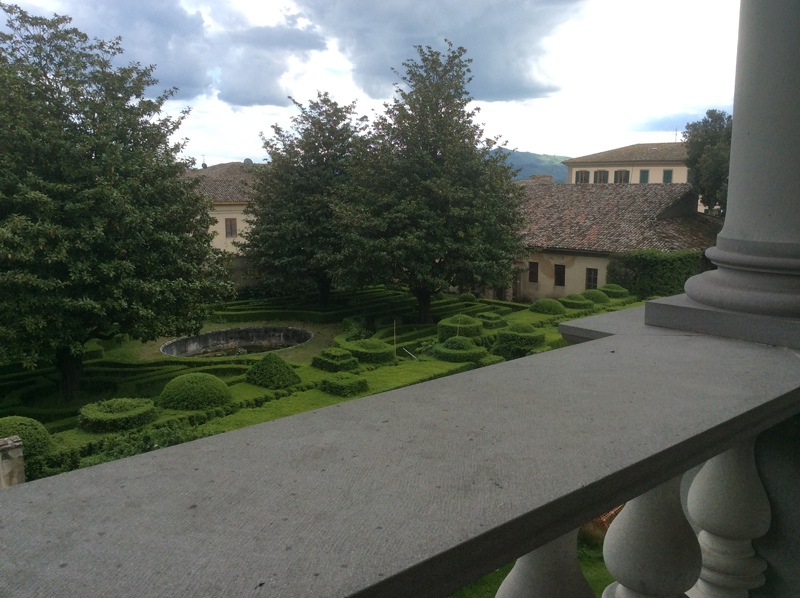 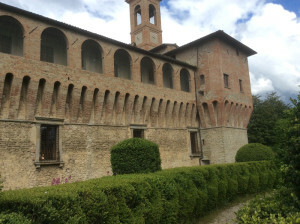 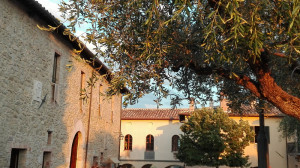 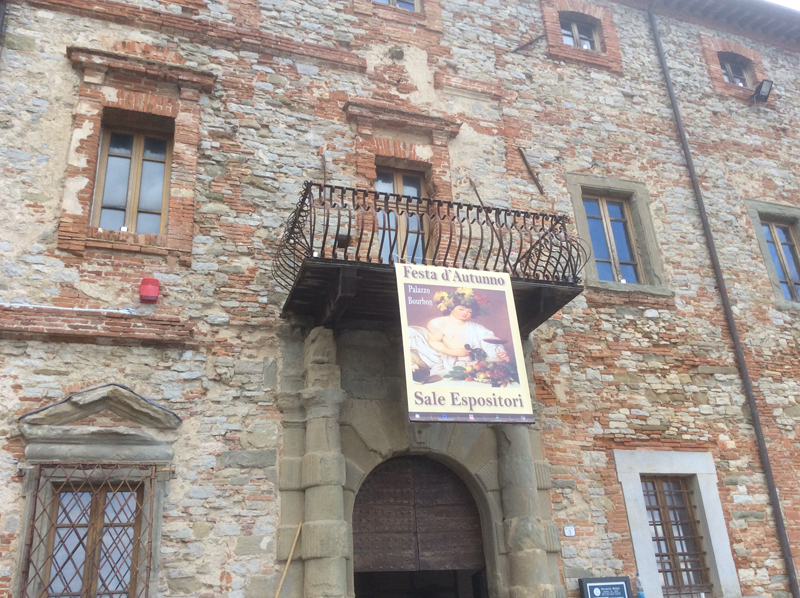 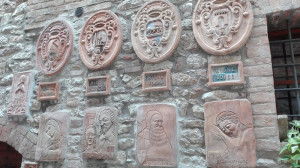 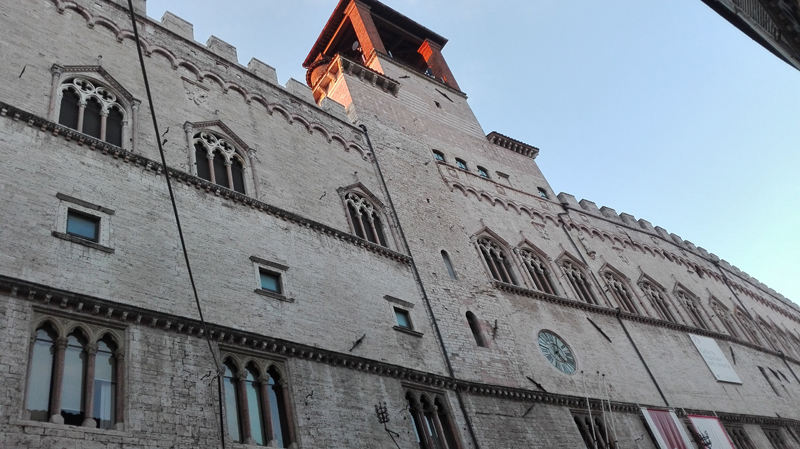 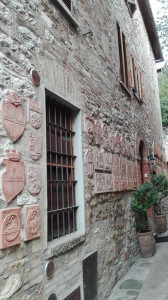 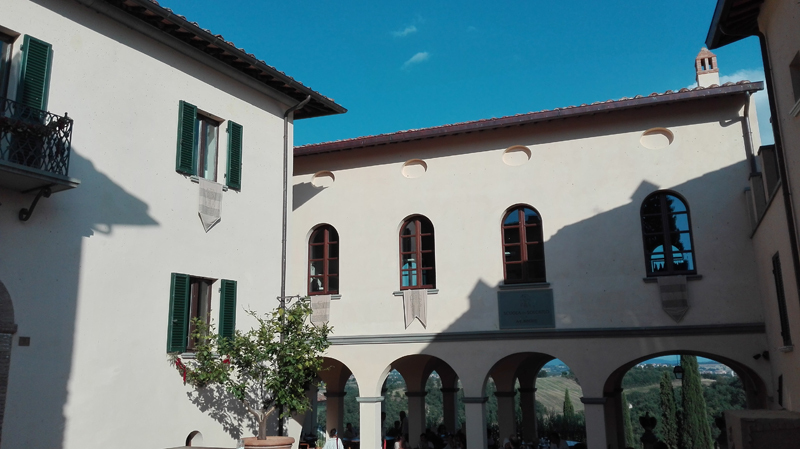 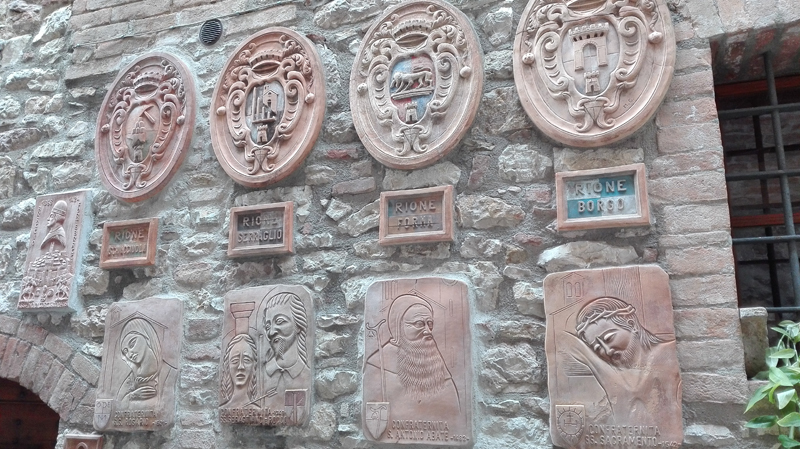 You can visit Palazzo Bourbon, built in the 1500s, the castle and the lovely Church of Santa Maria (La Pieve), with an interesting baptismal fount and the Bourbon family chapel. 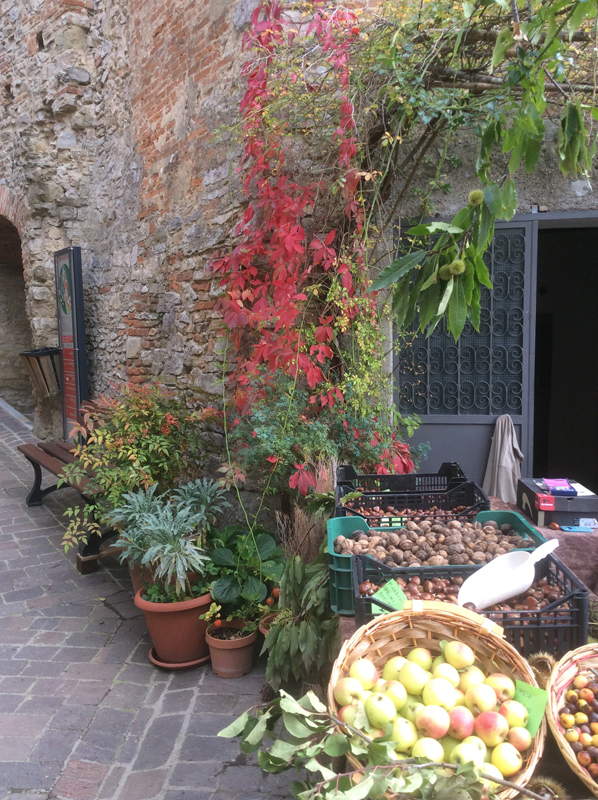 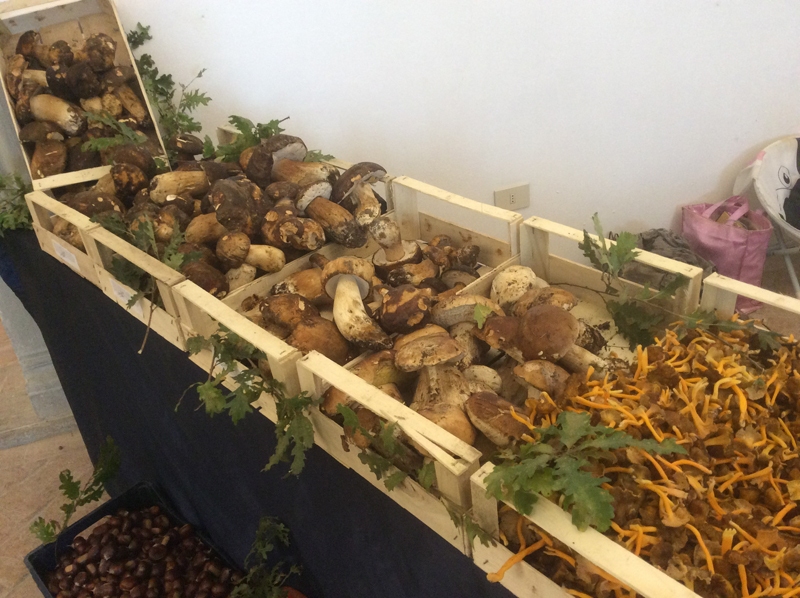 You can savour the abundant chestnuts, gourmet food, artisan beer (including chestnut beer! 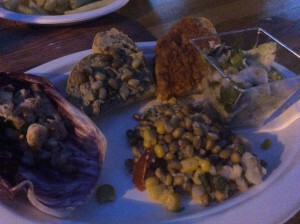 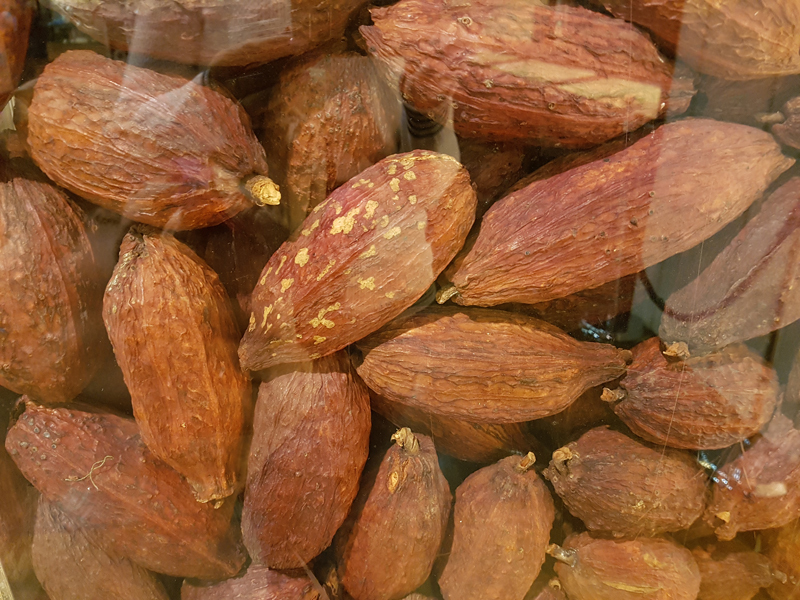 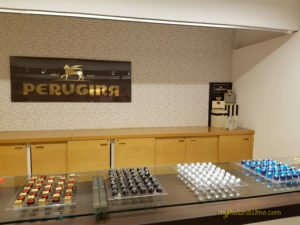 ), and sample a mouth-watering variety of chestnut foods. 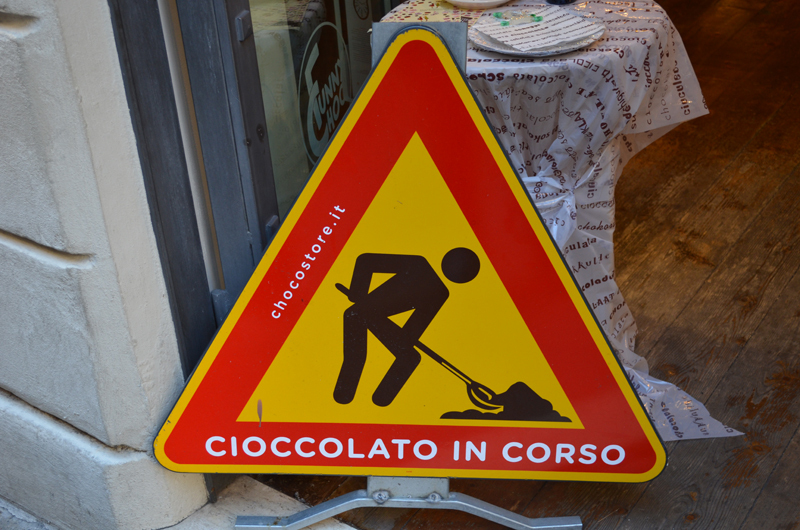 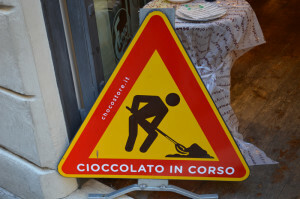 Treat yourselves to the local flavours: traditionally-made cheeses and salamis, porchetta, chocolate, honey and more. 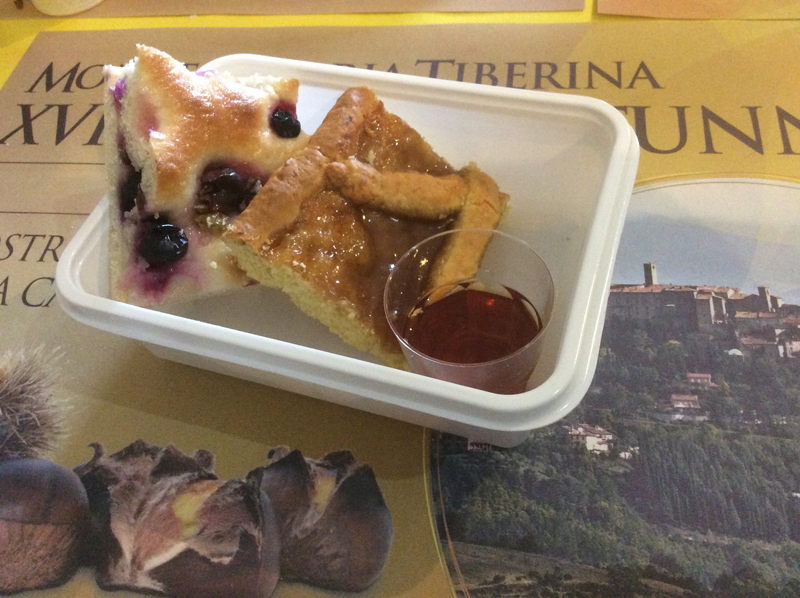 Local restaurants and food stalls are packed with nothing but life’s little pleasures 100% made in Umbria. 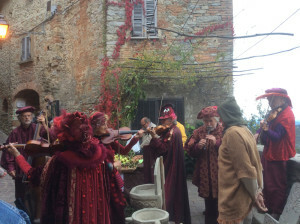 There’s always something for everyone to enjoy! 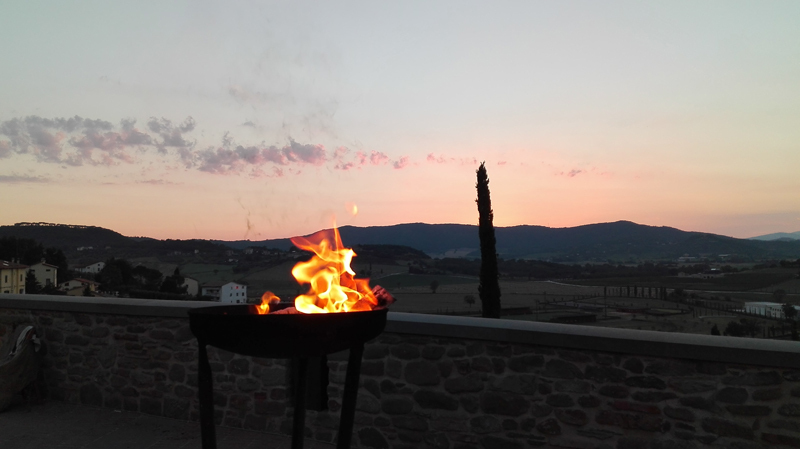 Cà di Baldo is a stunning b&b, tucked high in the hills near Città di Castello and the E45 highway. 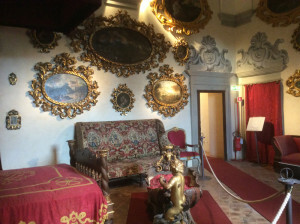 I’ll always remember my stay here. 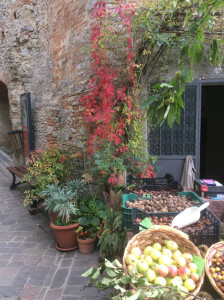 The owner spoiled us silly with heaps of fresh fruit, homemade jams, as well as gorgeous local wines. 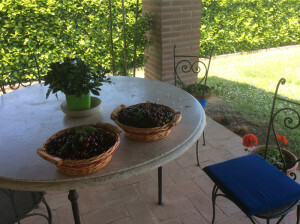 Although Cà di Baldo would be a winner by any standards, it is the genuine warmth and charm of the lovely hosts that make a stay here so outstanding. 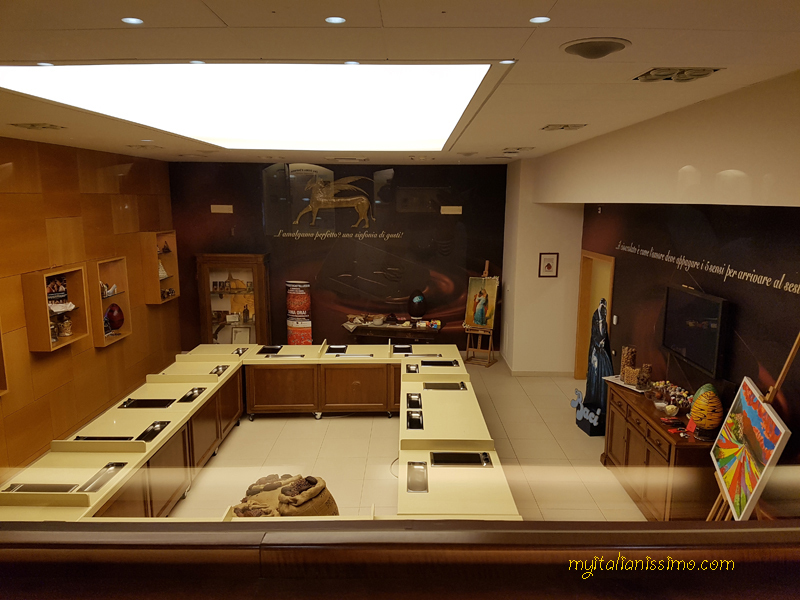 For lunch or dinner, guests can prepare a light meal in their own kitchenette. 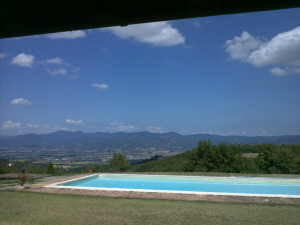 The b&b has a beautiful pool with views of the valley, where you can really unwind and bask in the sun after a day out. 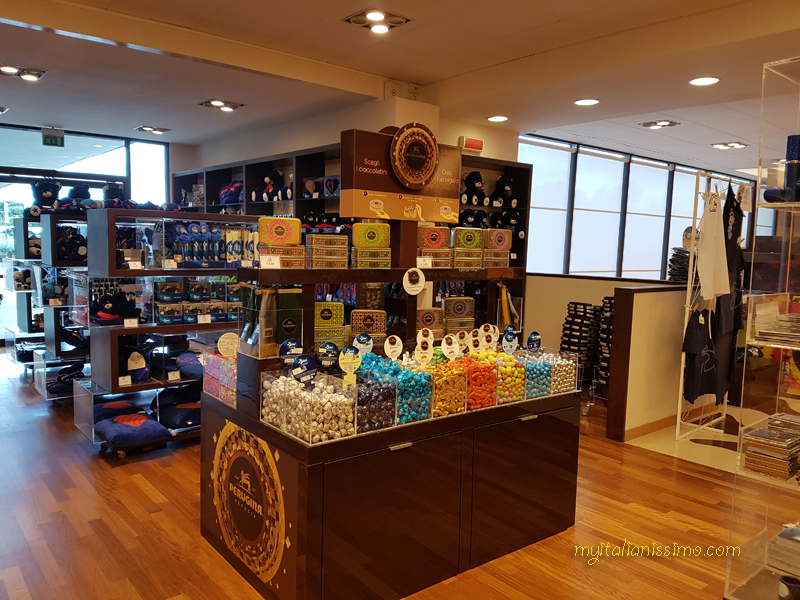 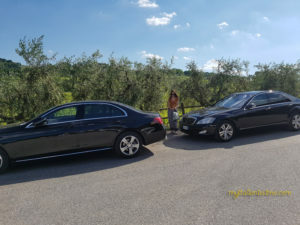 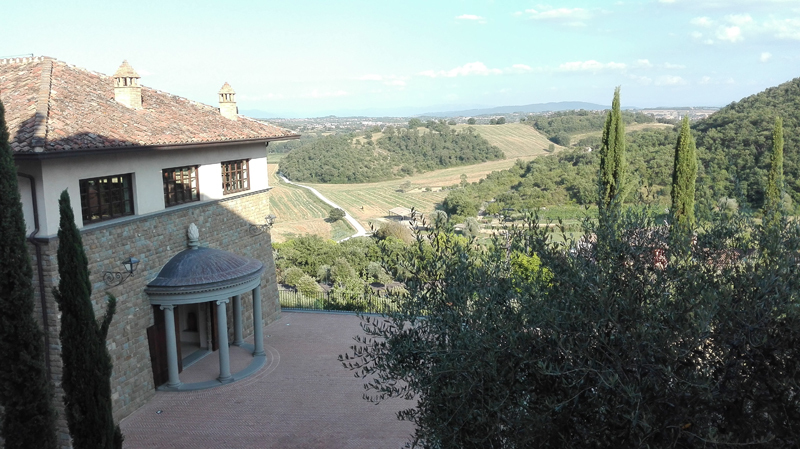 It is the perfect location from which to wander around, and easily visit the Valtiberina and lots of famous cities of Umbria and the nearby regions. 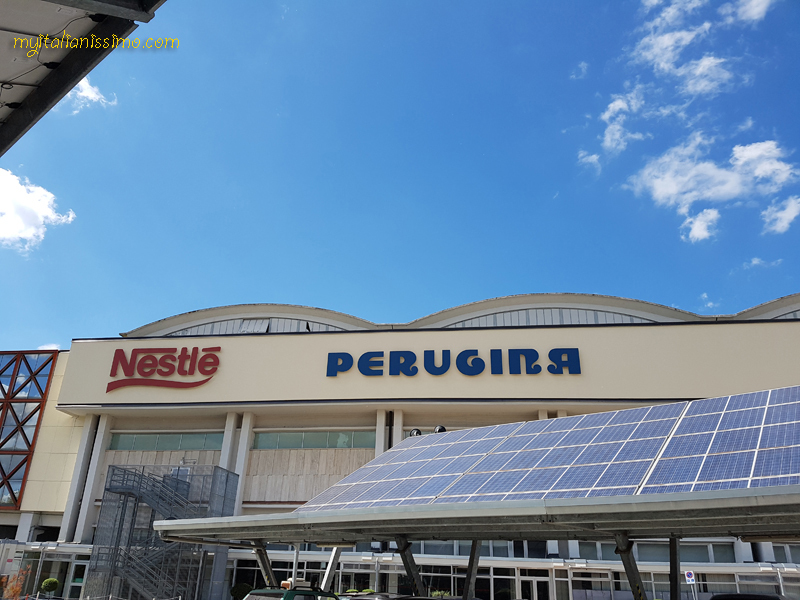 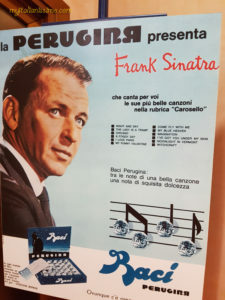 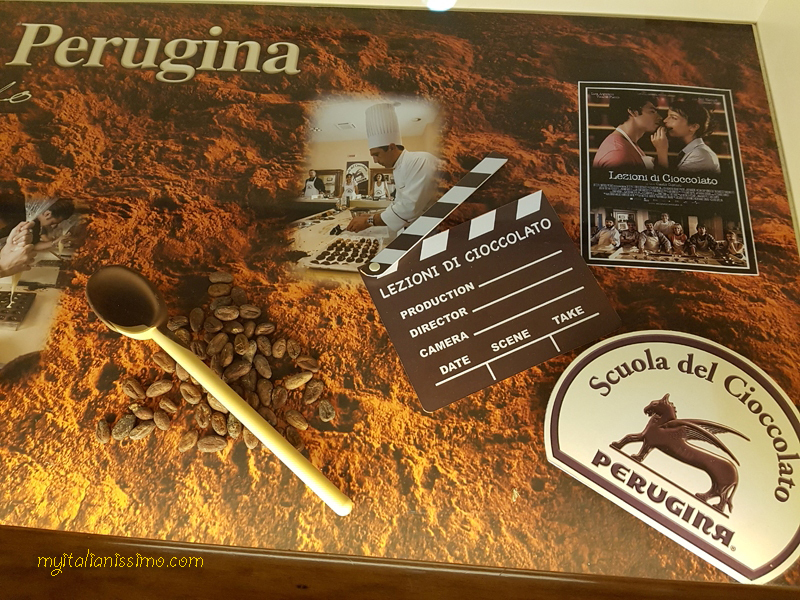 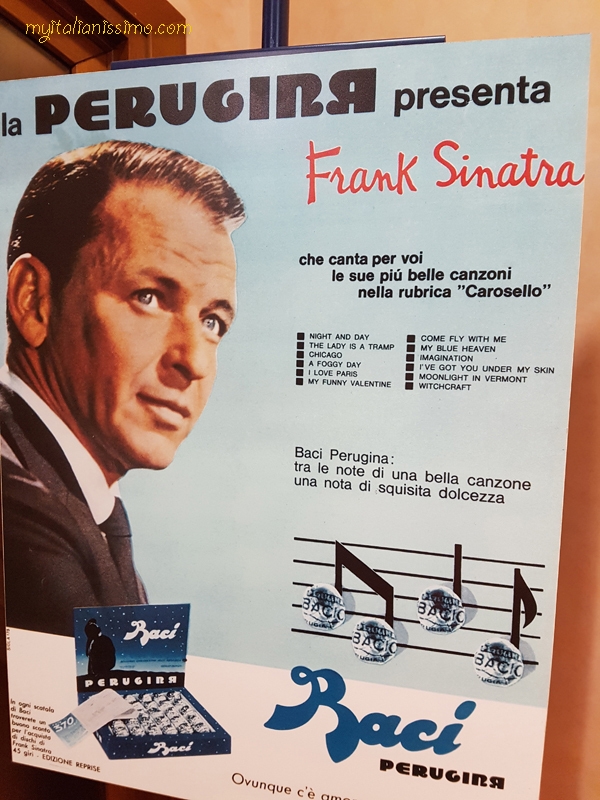 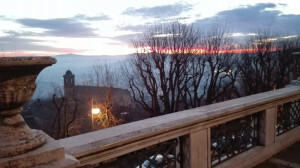 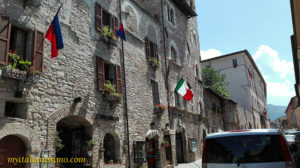 Perugia, Arezzo, Monterchi, Gubbio are in easy reach, and forays can also be made into neighbouring Marche, Emilia Romagna and the independent Republic of San Marino. Once owned by the Roman Empire, Assisi is a beautiful Umbrian town of worldwide fame and an important place of pilgrimage. 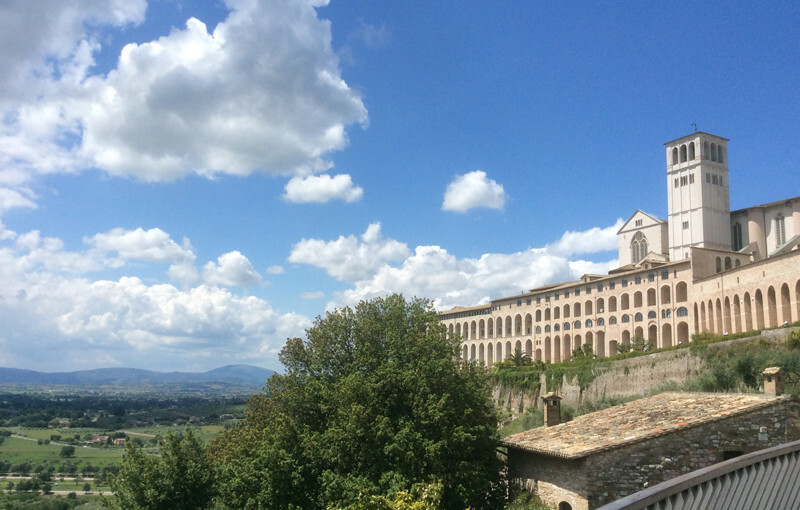 The Romans, who took control of central Italy in 295 BC, built the flourishing municipium Asisium on the western slopes of Monte Subasio. 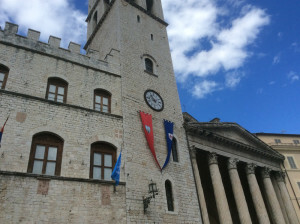 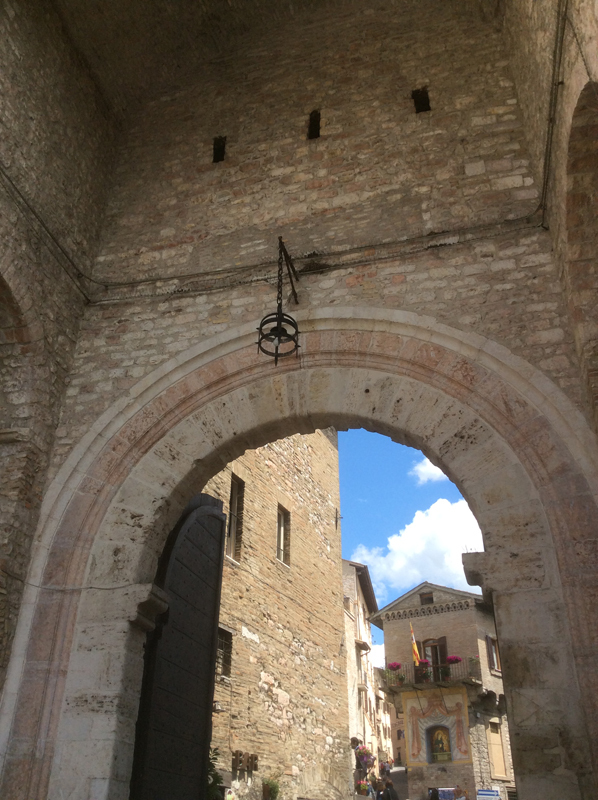 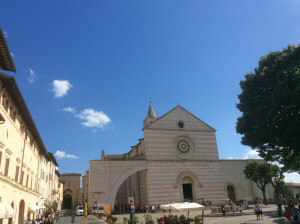 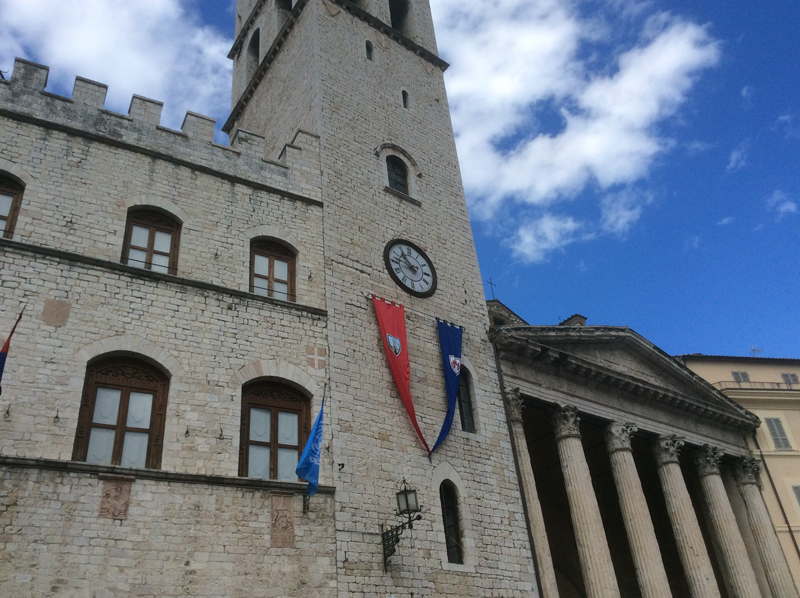 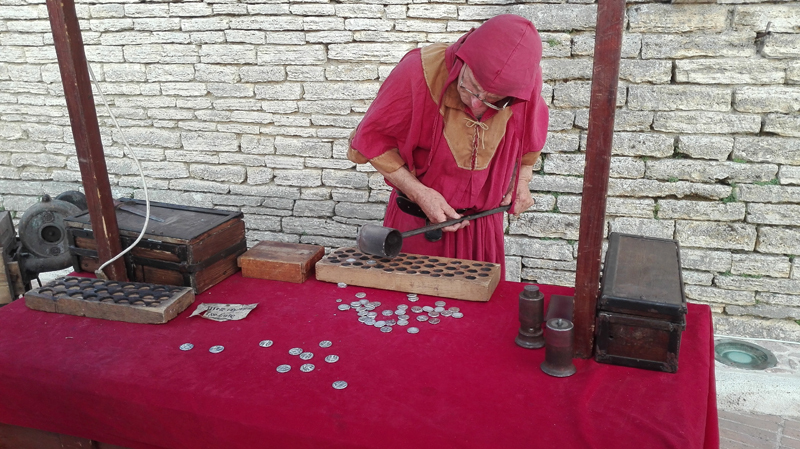 The city walls, the Forum, the Temple of Minerva are all Roman remains that can be found in Assisi today. 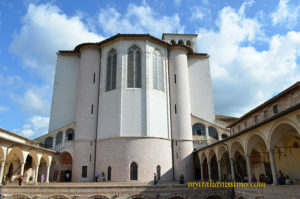 Converted to Christianity in 238 AD by bishop Rufino, Assisi is bound with its native son – St. Francis, born there in 1181/1182. 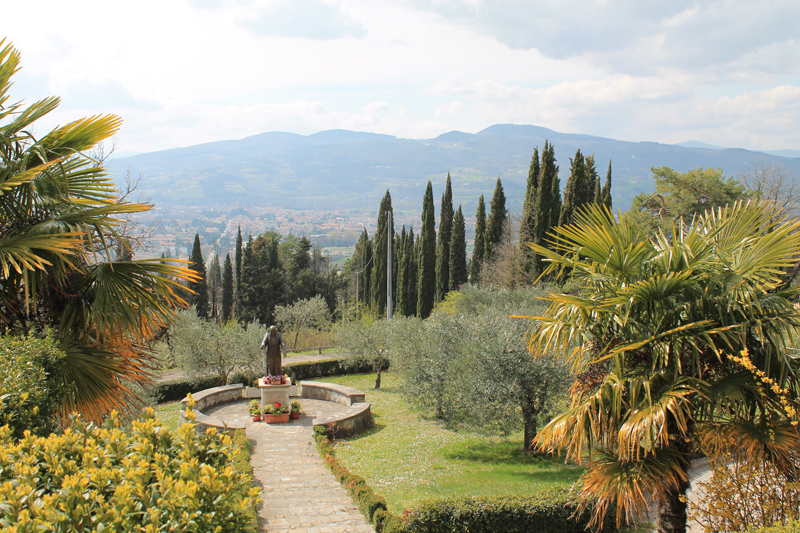 Like Jesus, Francis taught by example, living without worldly goods and cherishing the beauty of nature and God’s wonderful creation. St. Francis of Assisi founded an order of friars in the town in 1208, while his female counterpart, Clare, went on to establish the order of the Poor Clares. This stunning 3-level Romanesque-Gothic Basilica was built in the 13th century and is decorated from top to bottom by precious frescoes by the leading Sienese and Florentine artists of the time. 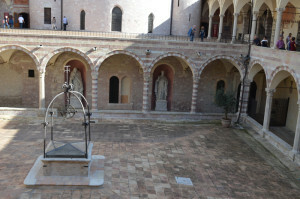 The crypt houses the body of St. Francis himself. 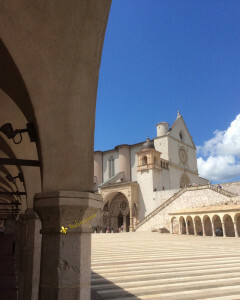 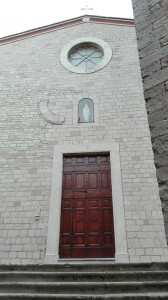 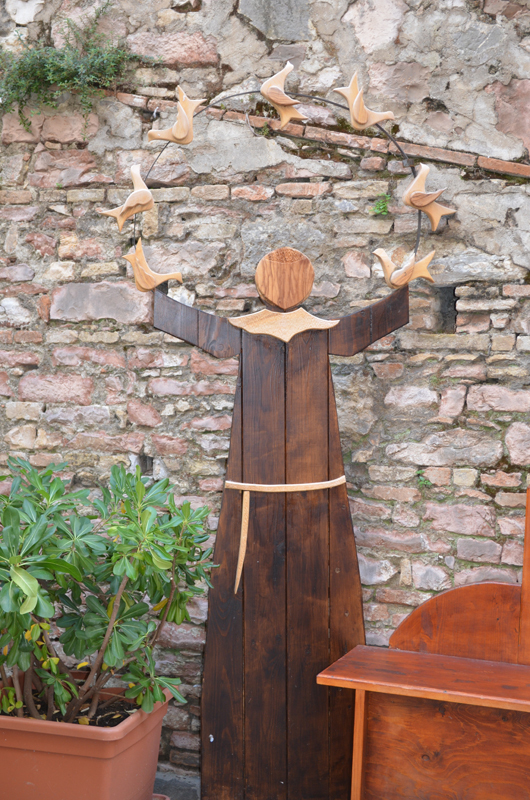 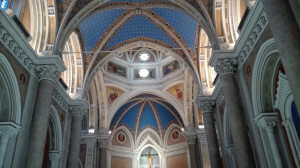 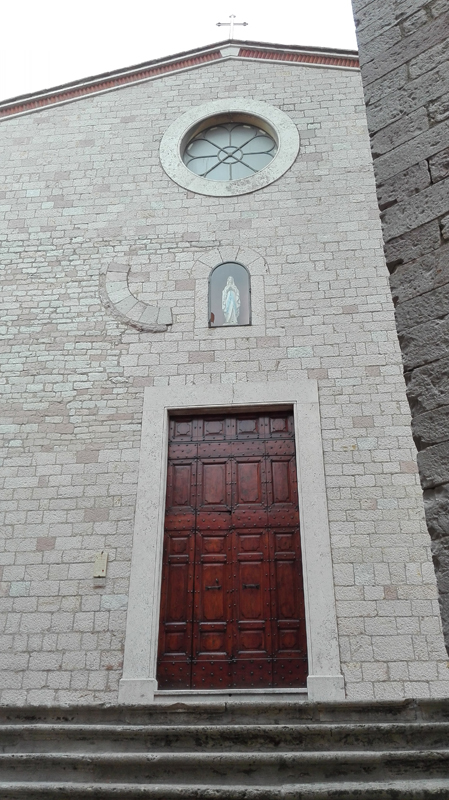 In the nearby Basilica of St. Clare hangs the wooden crucifix St. Francis knelt before in 1206 to ask for guidance, and then followed the call to rebuild the Porziuncola Church in the valley right below Assisi. 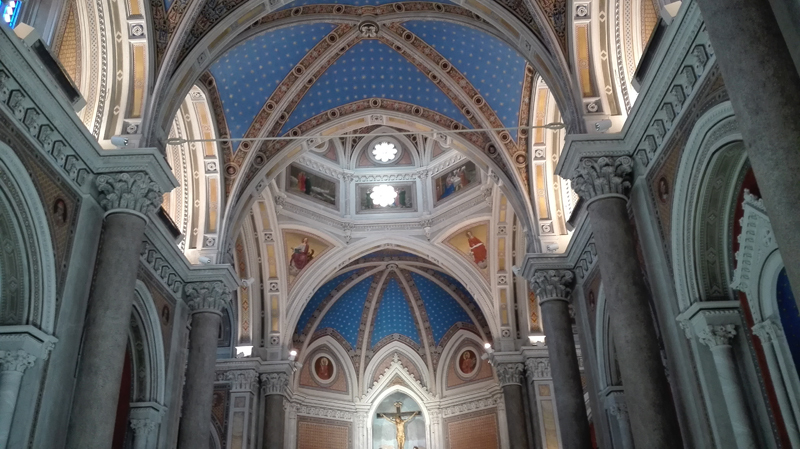 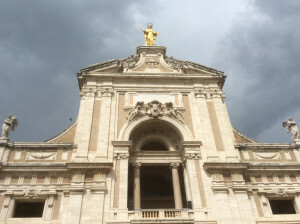 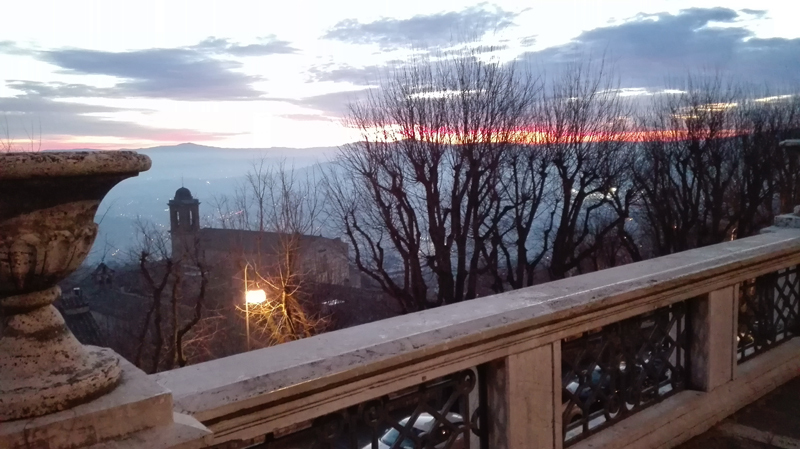 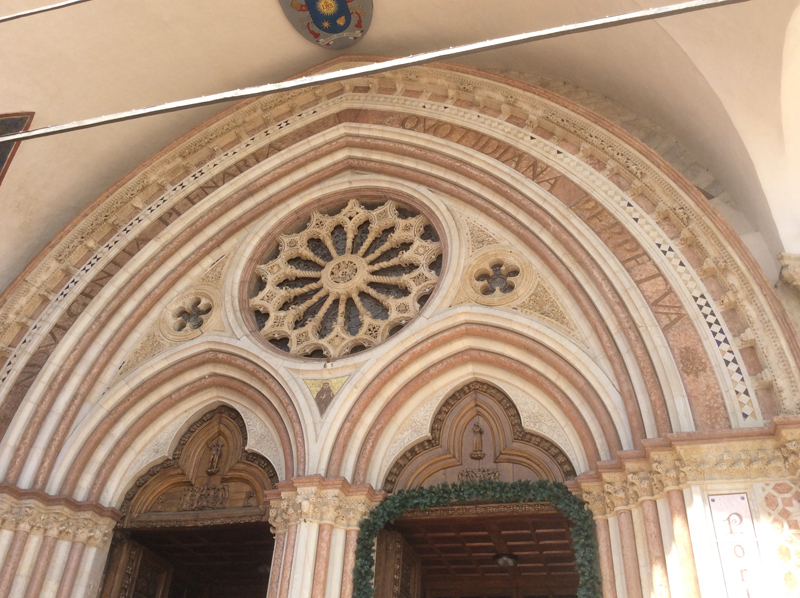 Today you will find the huge Basilica of Santa Maria degli Angeli built around it. 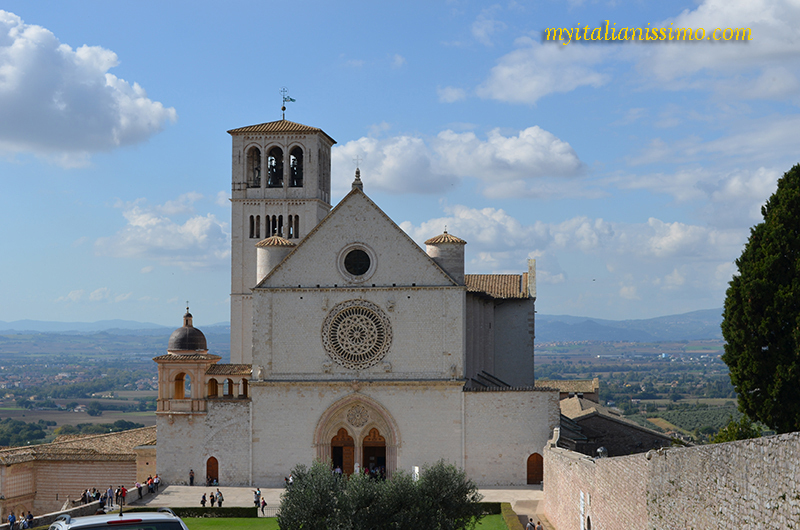 Francis was proclaimed a saint by Pope Gregory IX in 1228, and shares honours with St. Catherine of Siena as the patron saint of Italy. 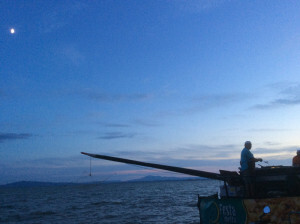 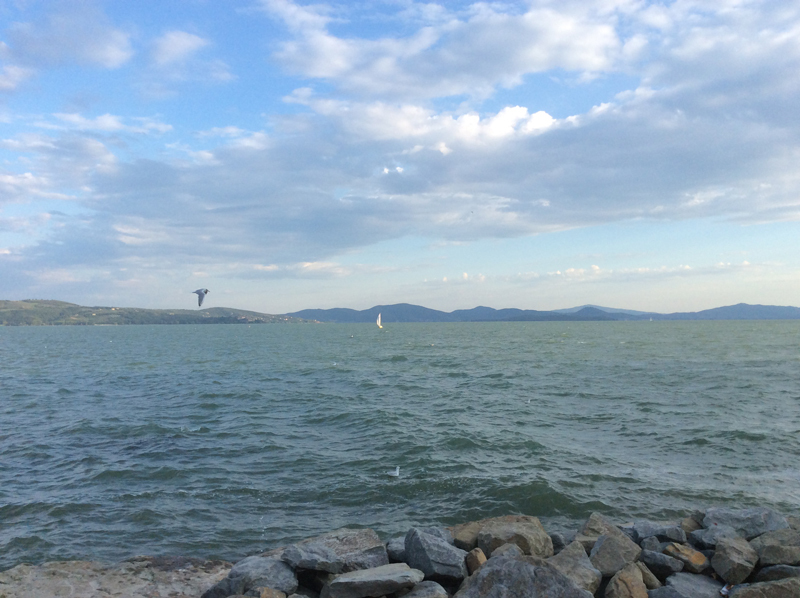 The fascinating Lake Trasimeno is the forth lake for surface in Italy, where mythology blends seamlessly with history. 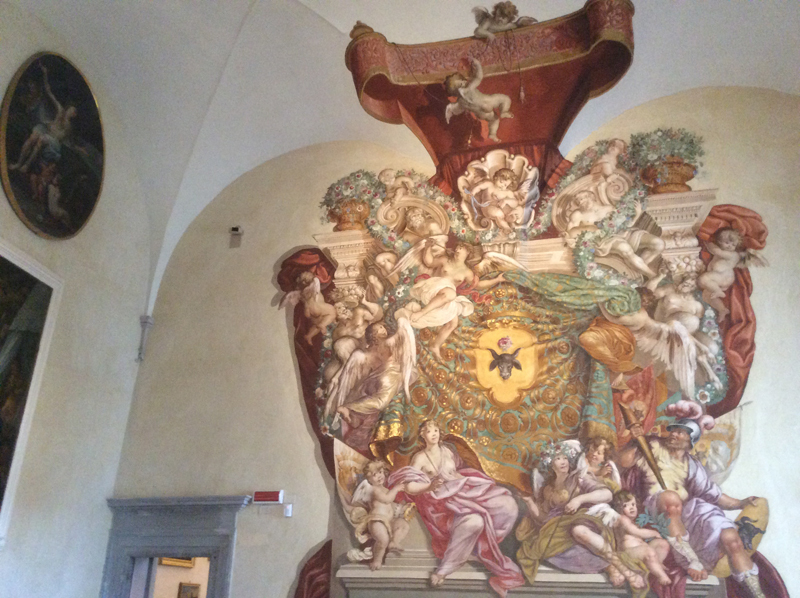 It was considered sacred by the Etruscans, who believed it was an earthly representation of Heaven. 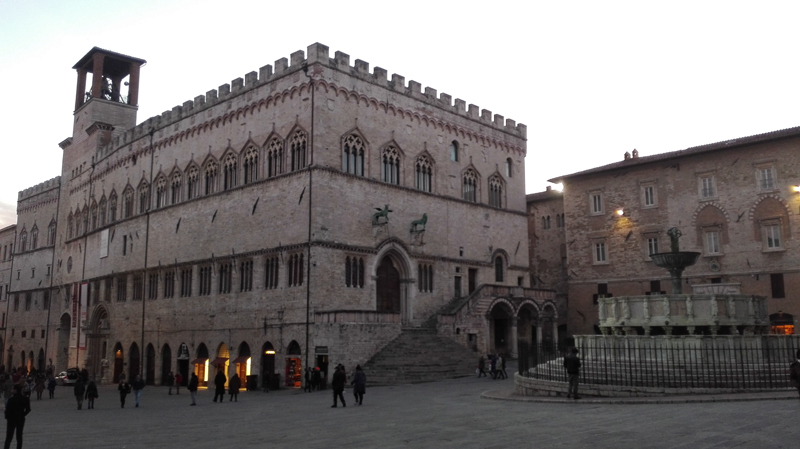 Three of the main Etruscan cities – Perugia, Chiusi and Cortona – are within 20 km of the Lake. 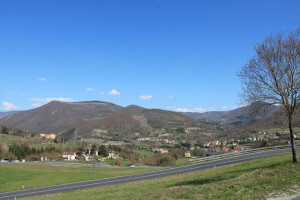 Nowadays eight towns surround the Lake, some on panoramic hilltops, and others on the shore. 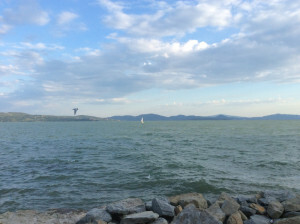 There are three islands in the Lake. La Festa della Padella in Passignano, organized for the citizens and the many tourists who visit the city in August, offers fine cuisine, including the fish caught by the local professional fishermen. 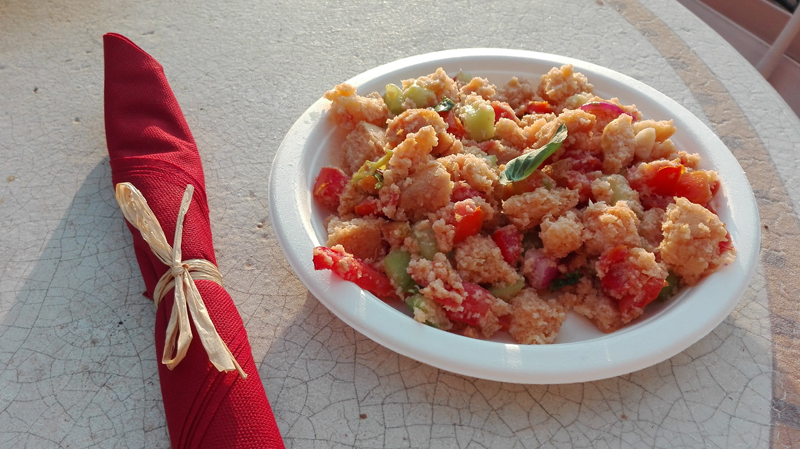 Here you’ll find traditional dishes and brand new recipes like the delicious crostini with perch, red swamp crayfish salad, tench crostini, perch & wheat salad, as well as fagiolina, the tiny bean that thrives in the ideal climate of the lake and cultivated here since the Etruscan times. 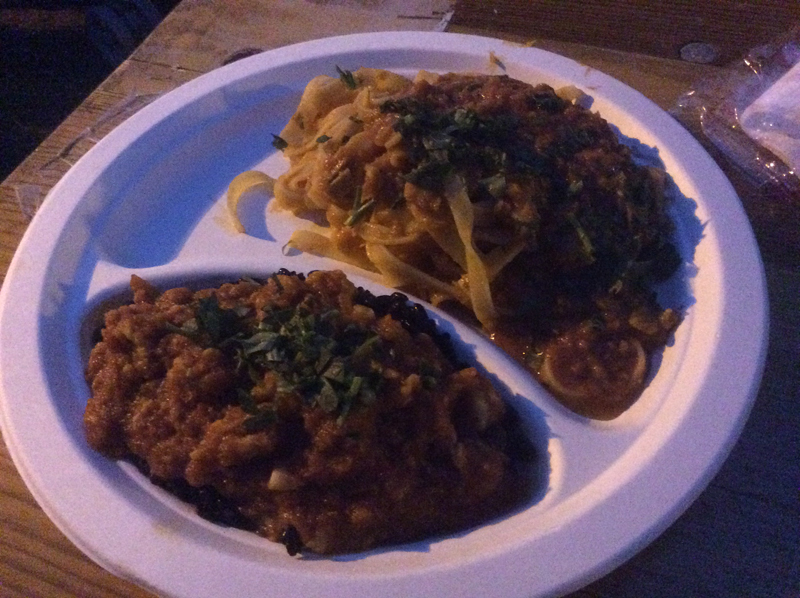 The First Course Combo: Taglierini with fish fillet, and Black Rice with red swamp crayfish sauce. 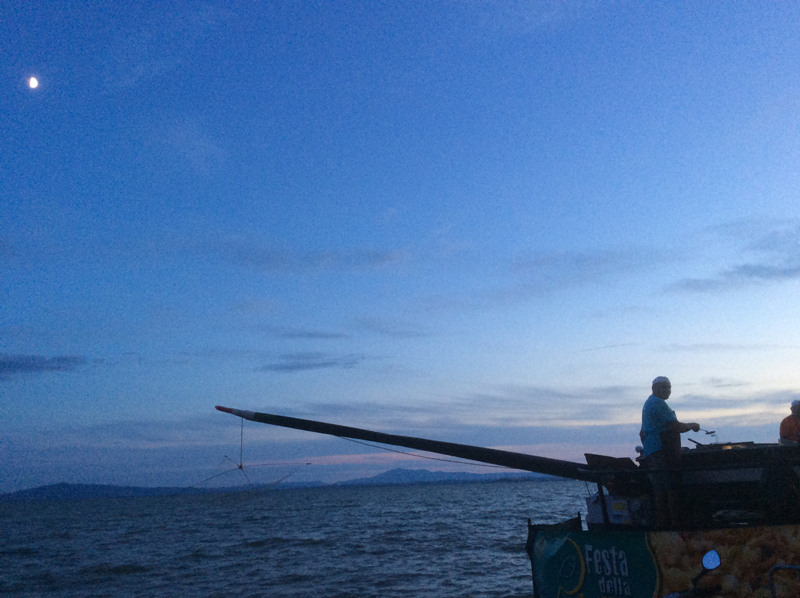 A separate plaudit for the Regina carp, Trasimeno’s best known fish. 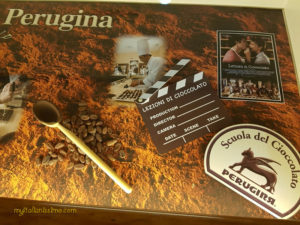 Representing the Wine Road of Colli del Trasimeno, Azienda Agricola Pucciarella. 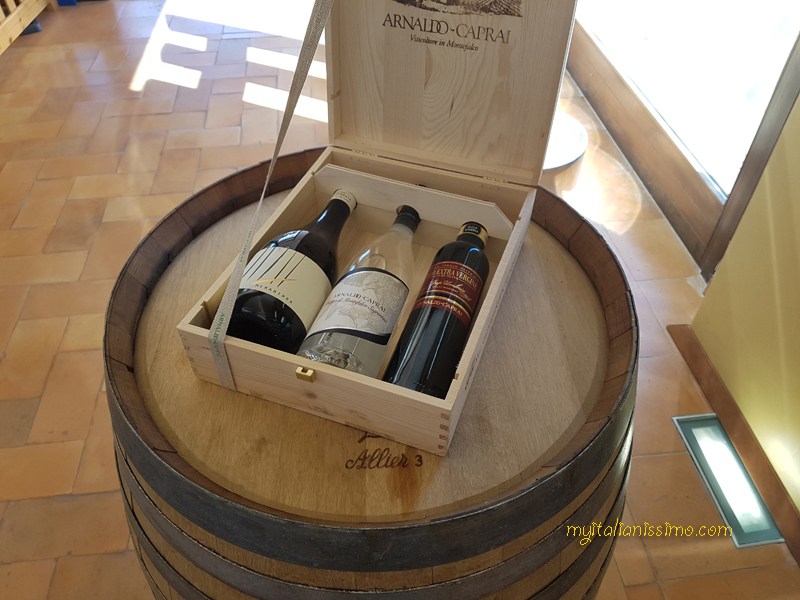 The fine notes of their Agnolo perfectly matched the lake’s culinary delights.